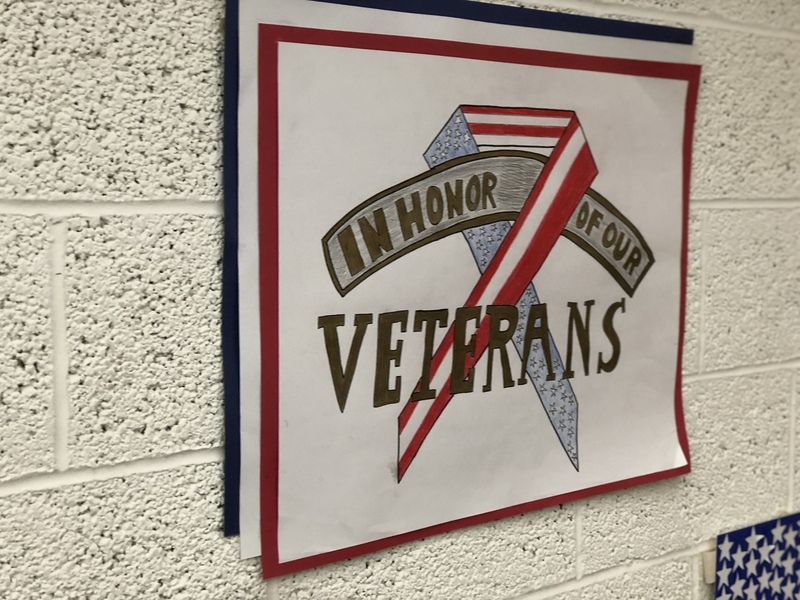 Veterans — both present and past — were honored throughout Neshannock Township School District. 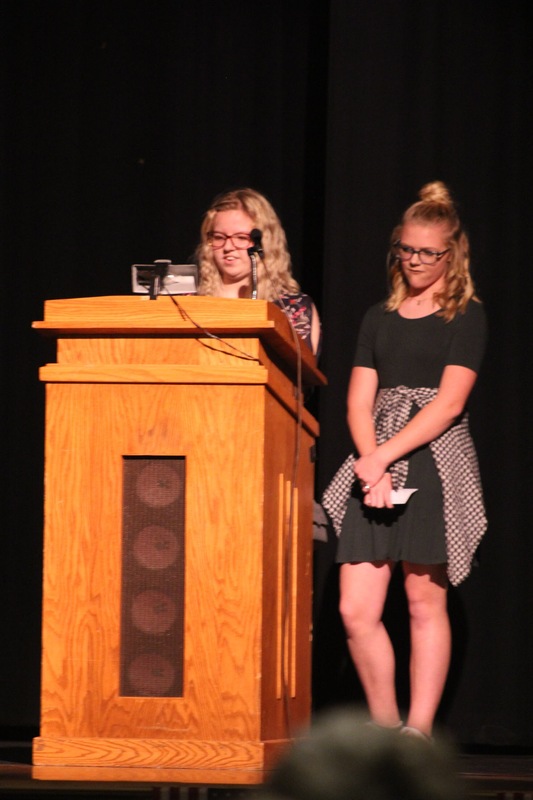 Both the Jr./Sr. 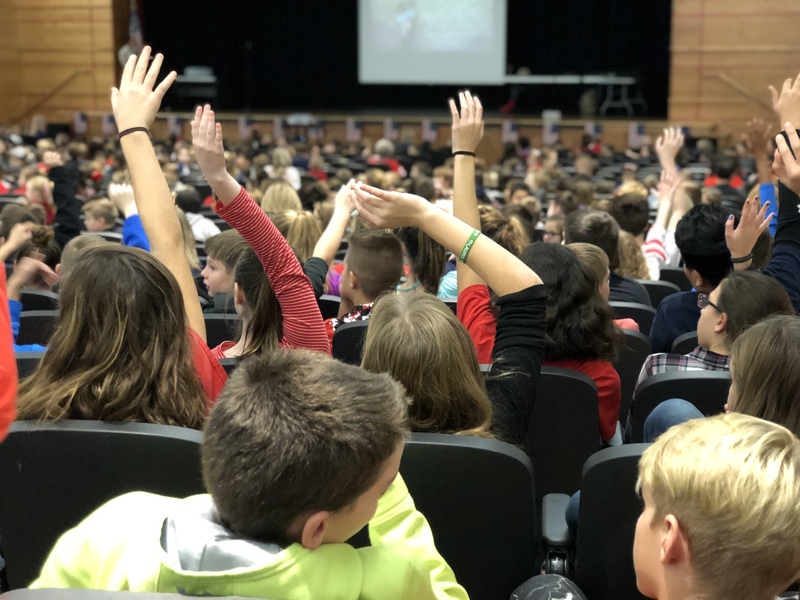 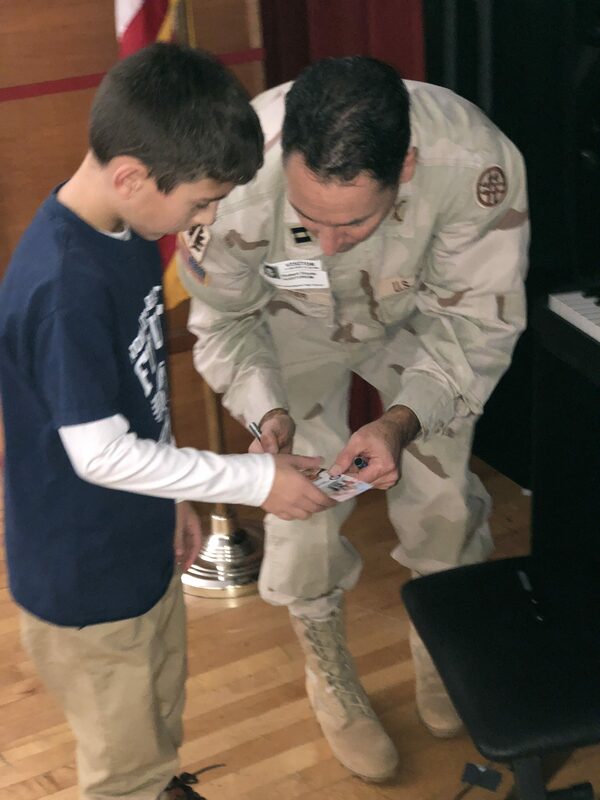 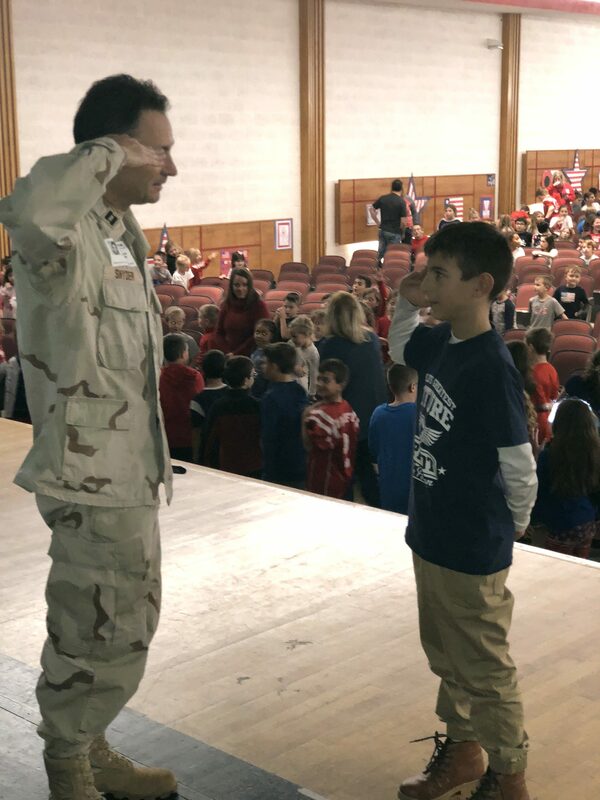 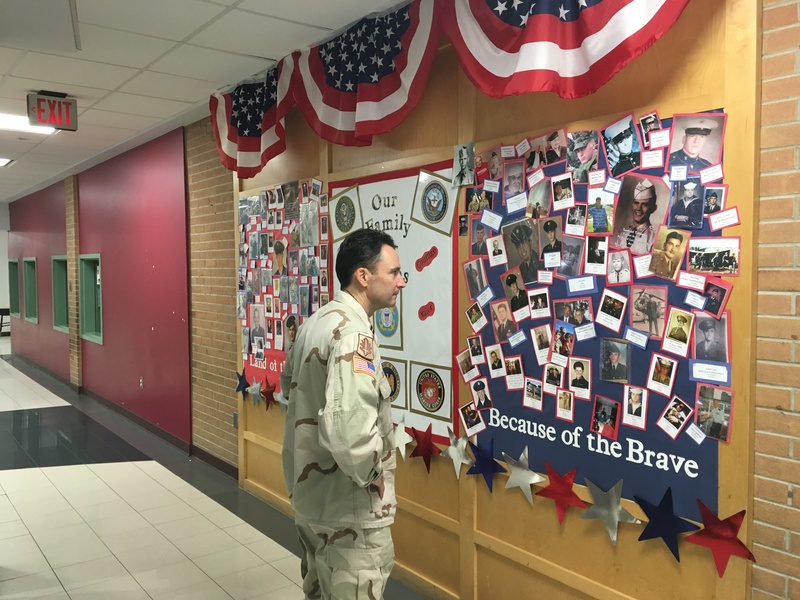 High School and Memorial Elementary School hosted programs honoring our nation’s heroes. 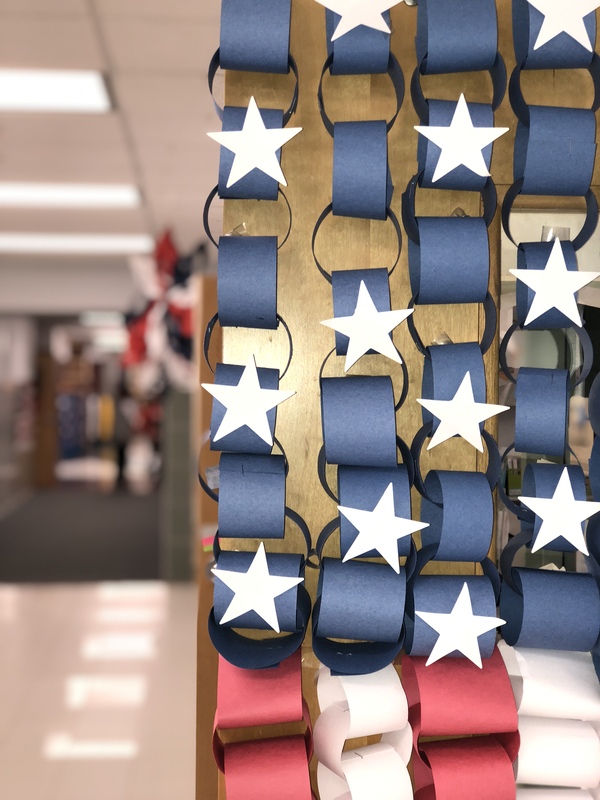 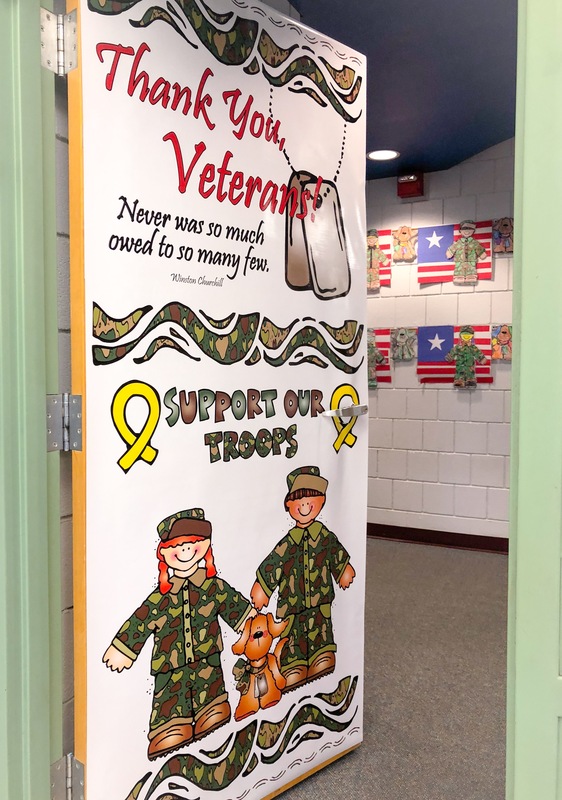 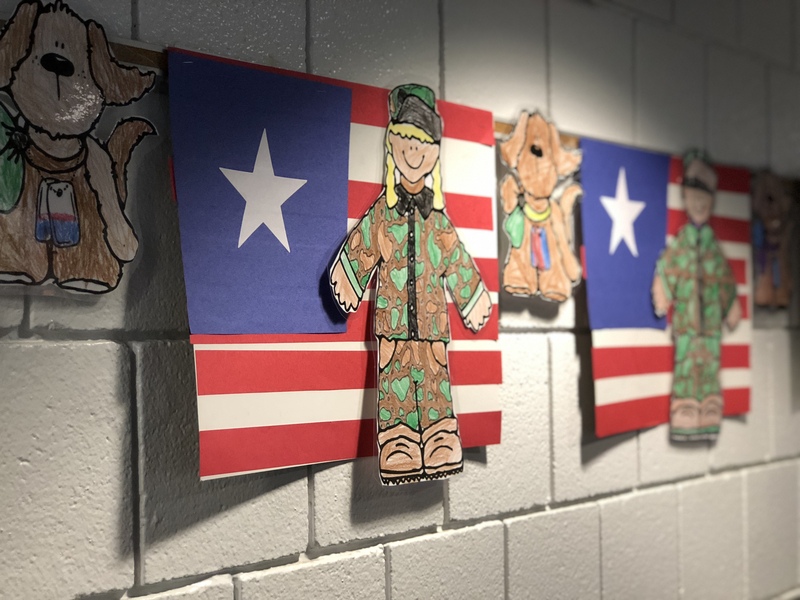 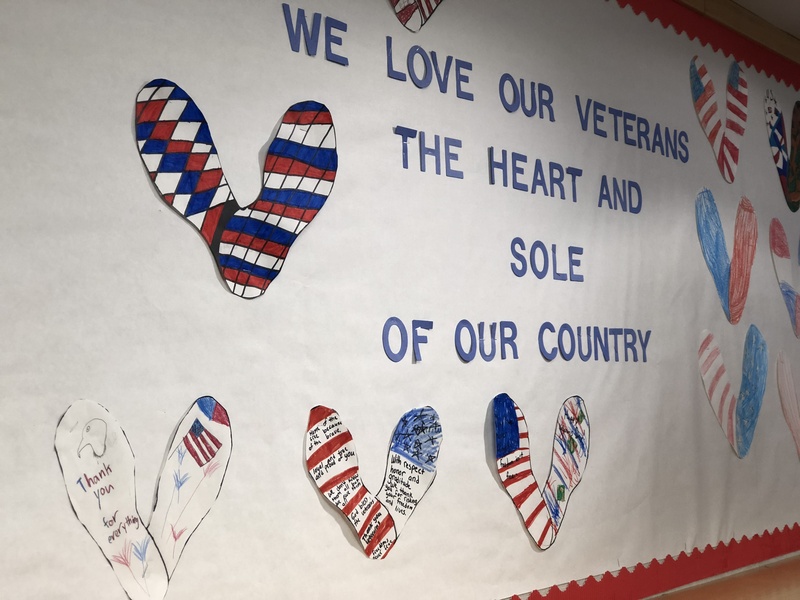 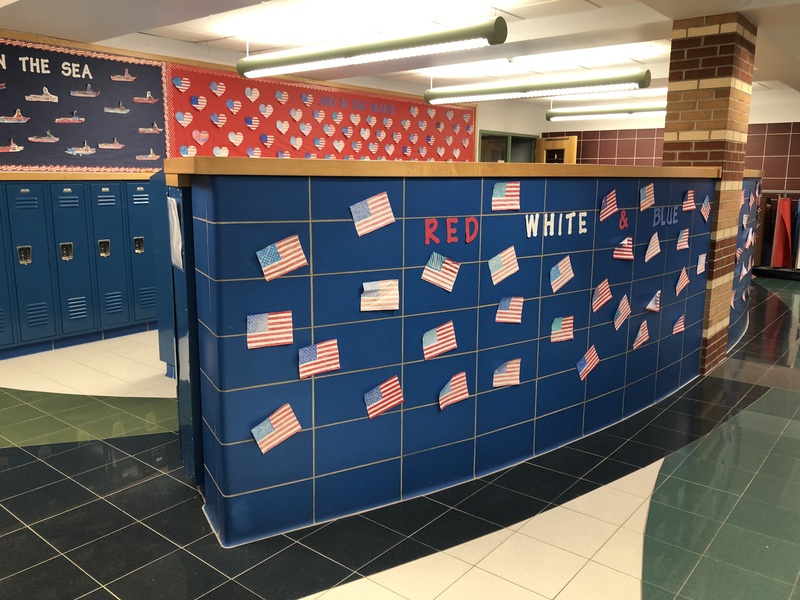 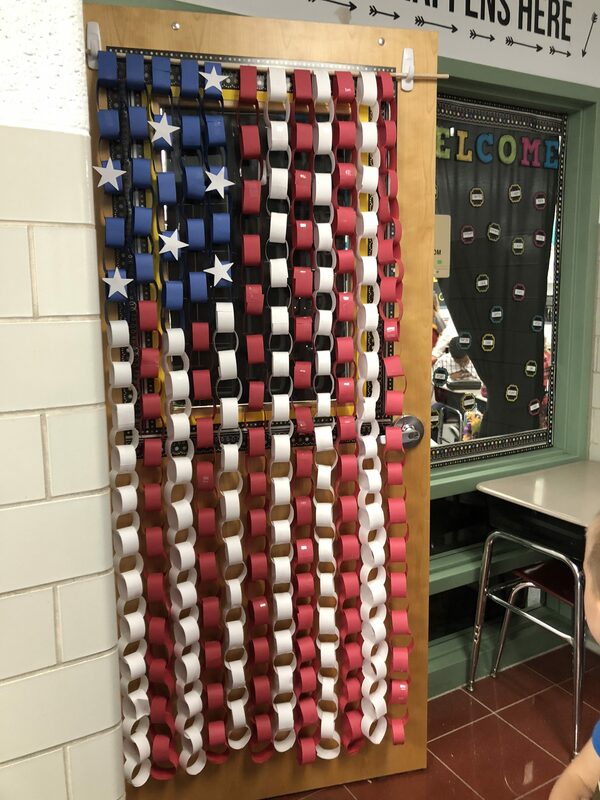 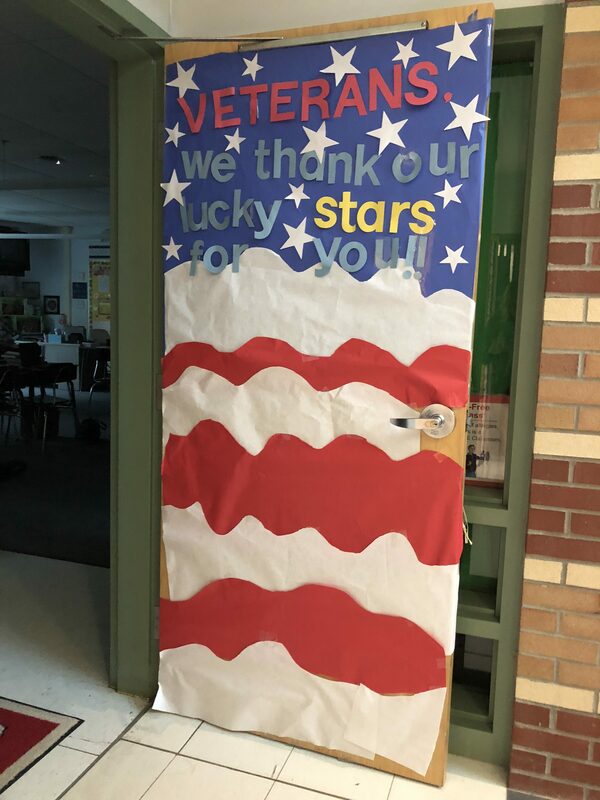 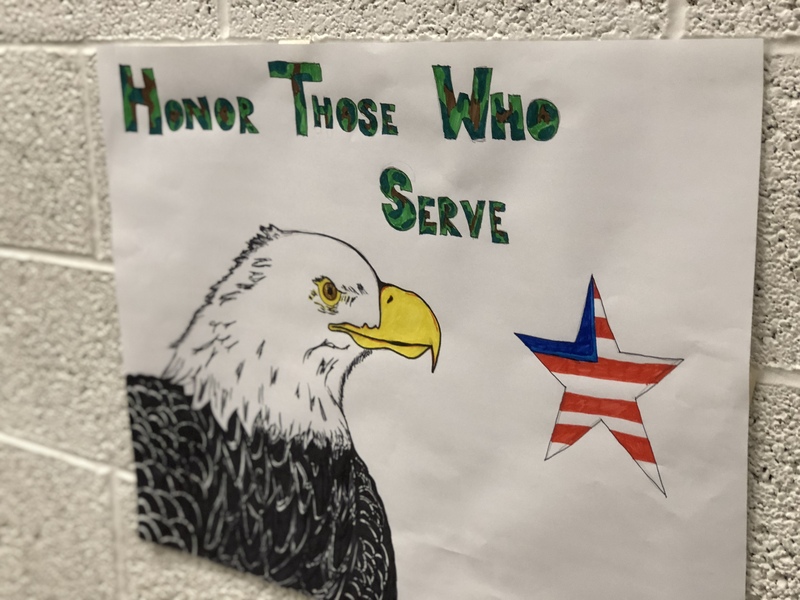 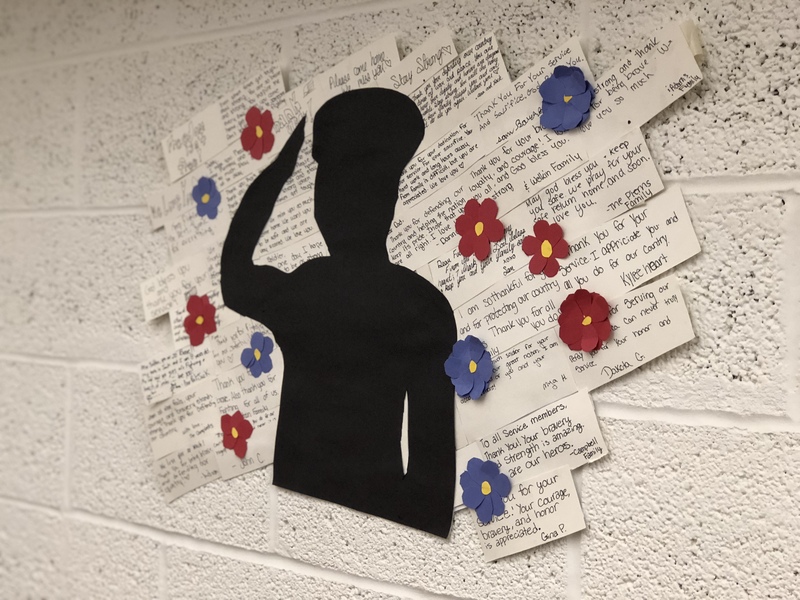 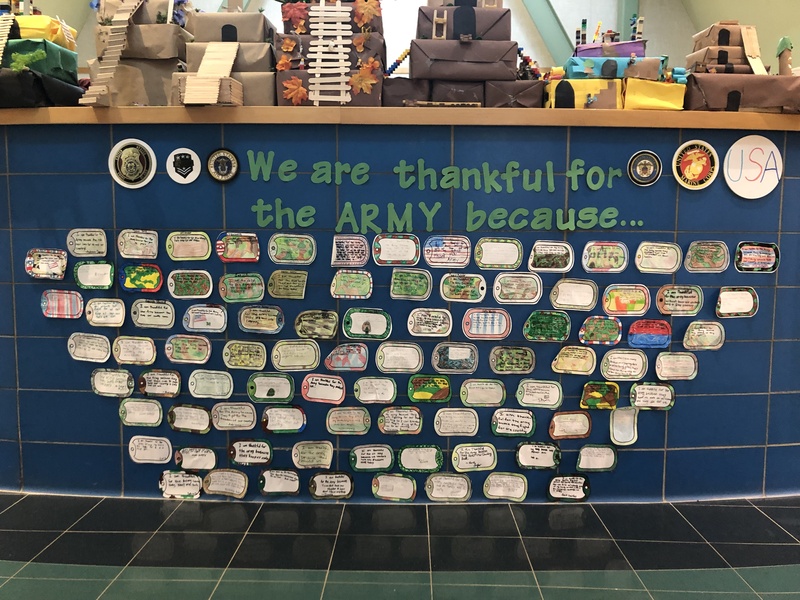 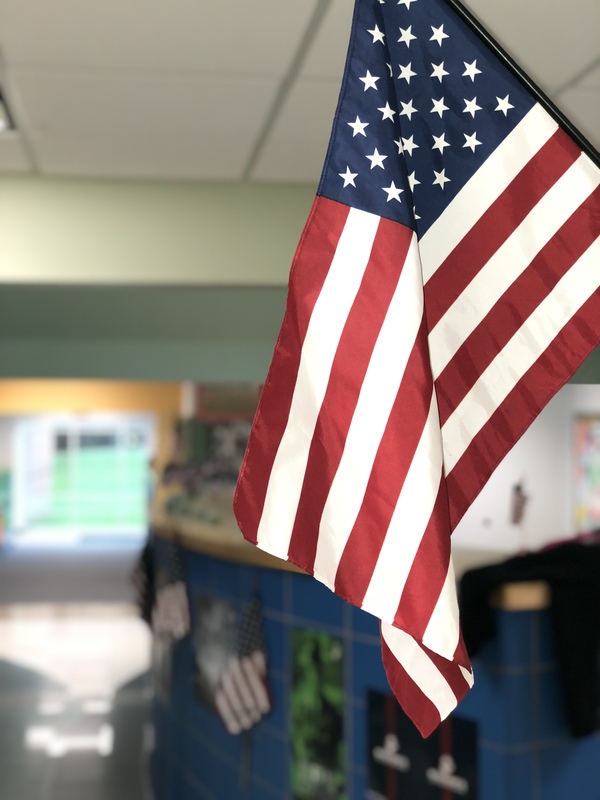 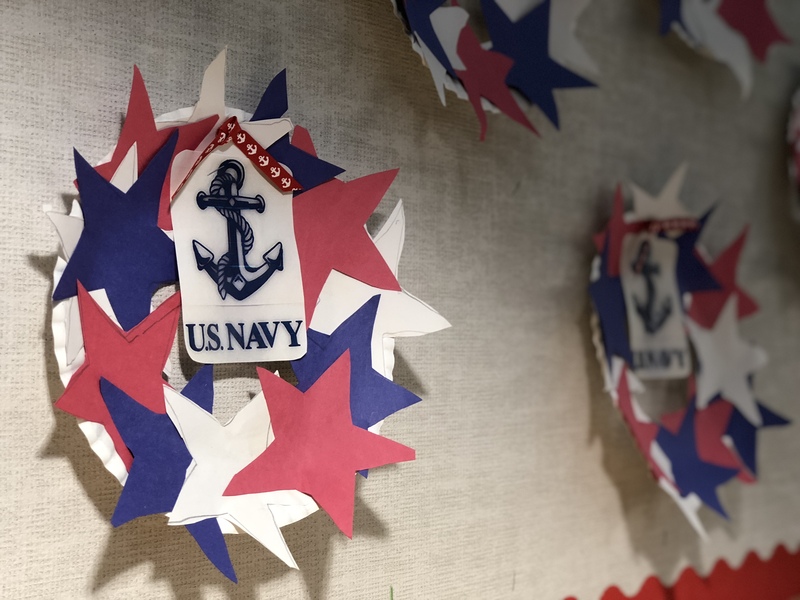 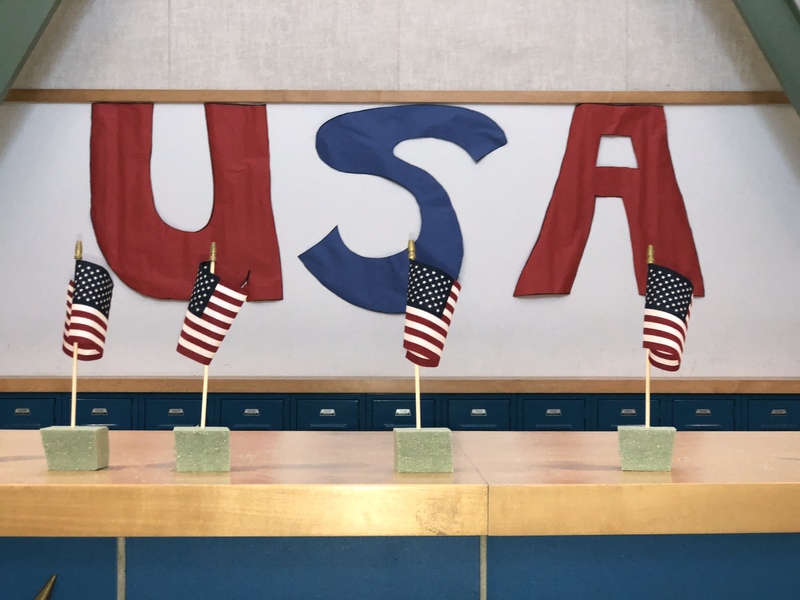 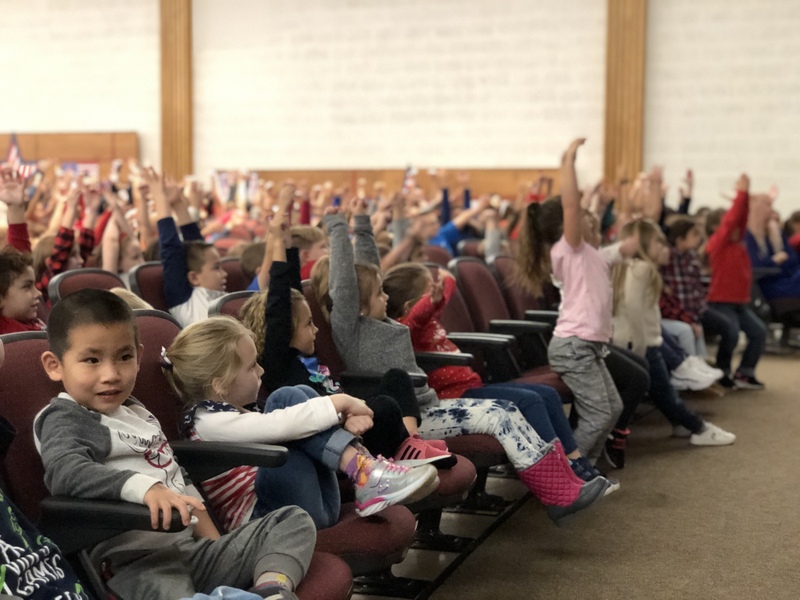 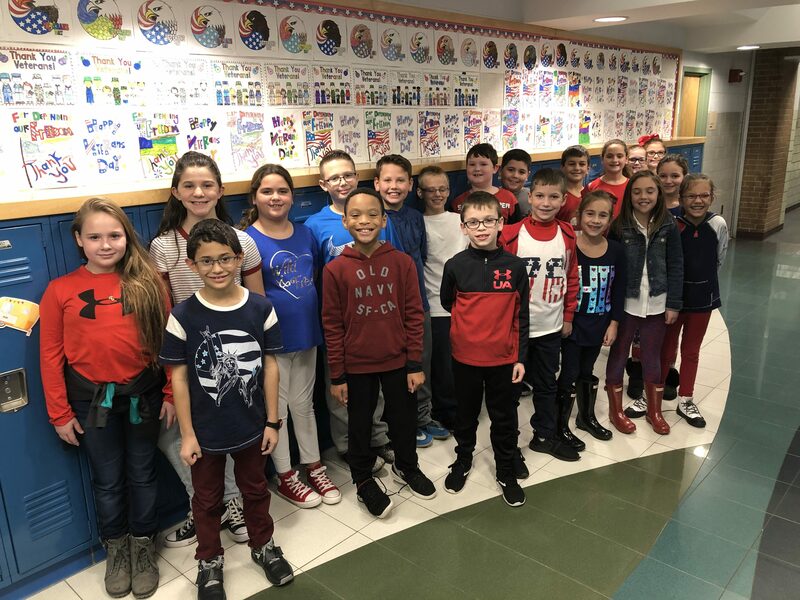 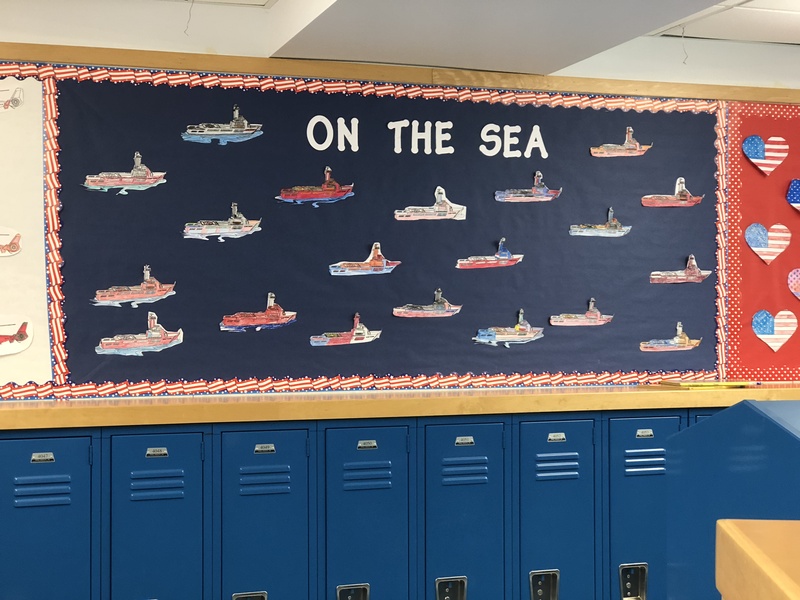 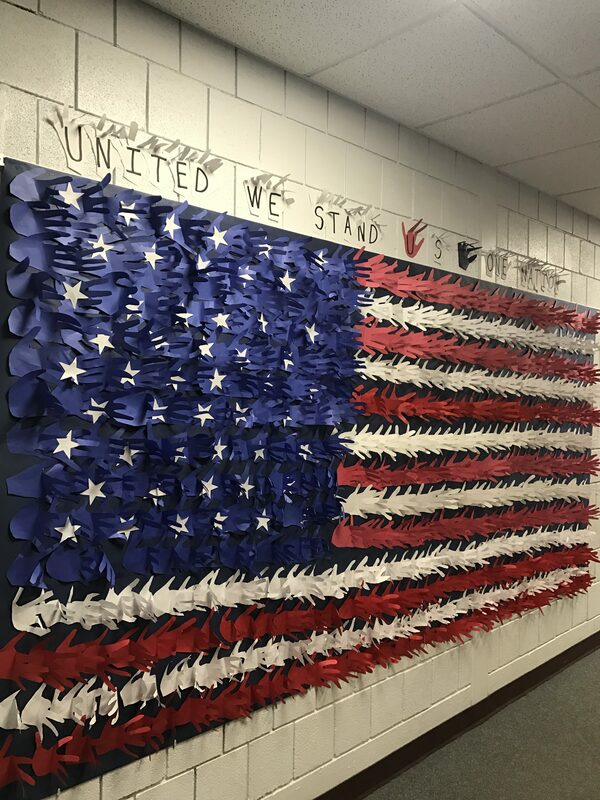 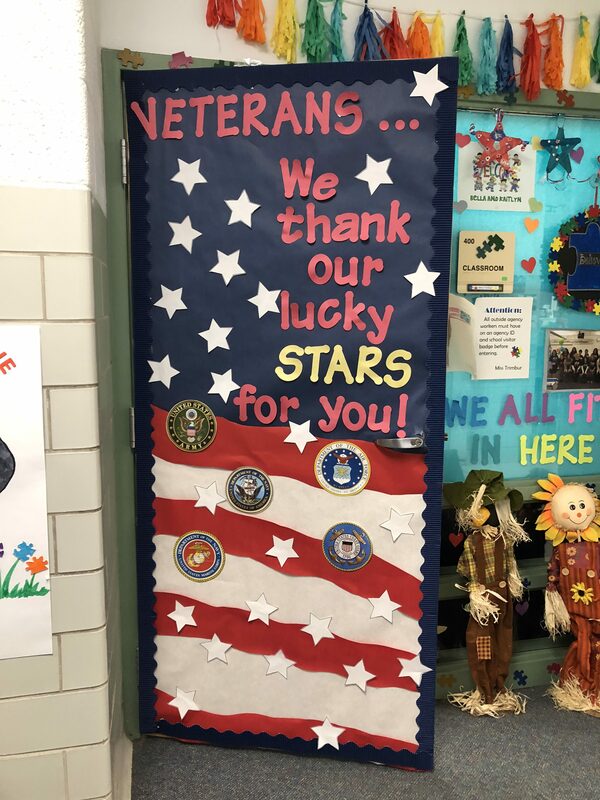 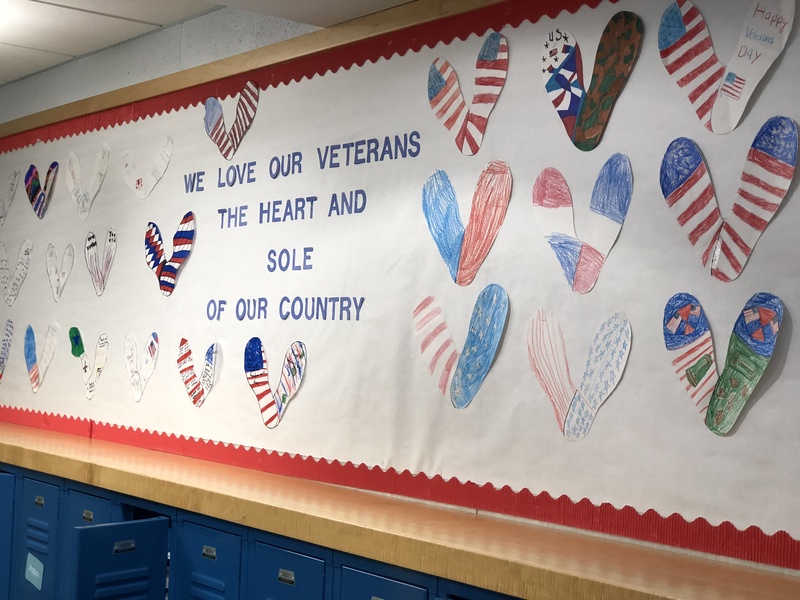 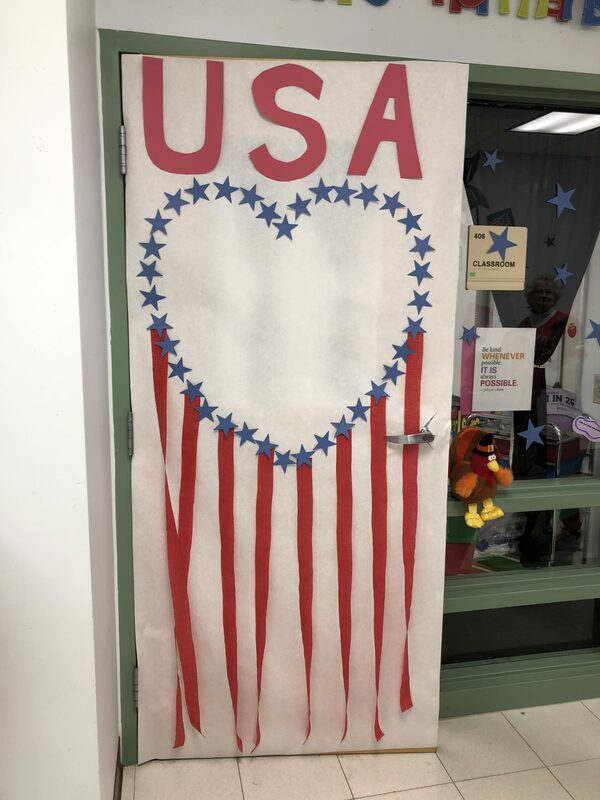 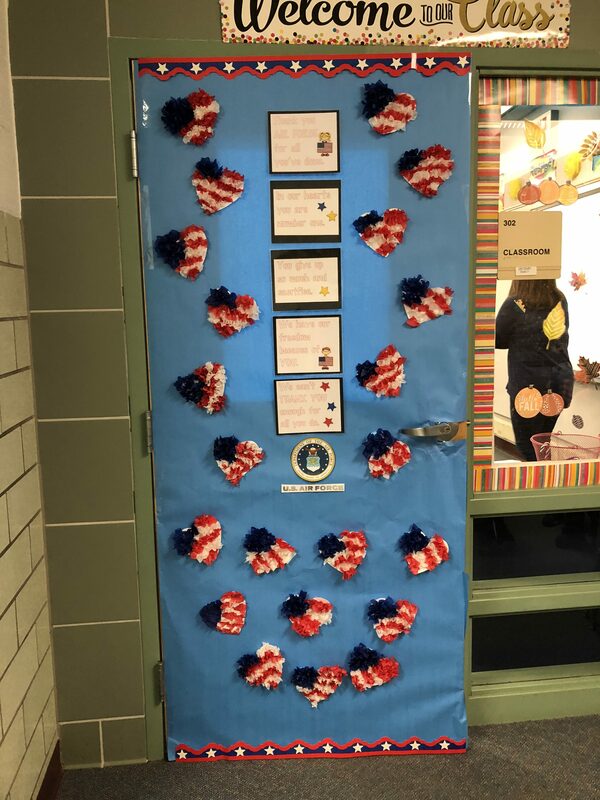 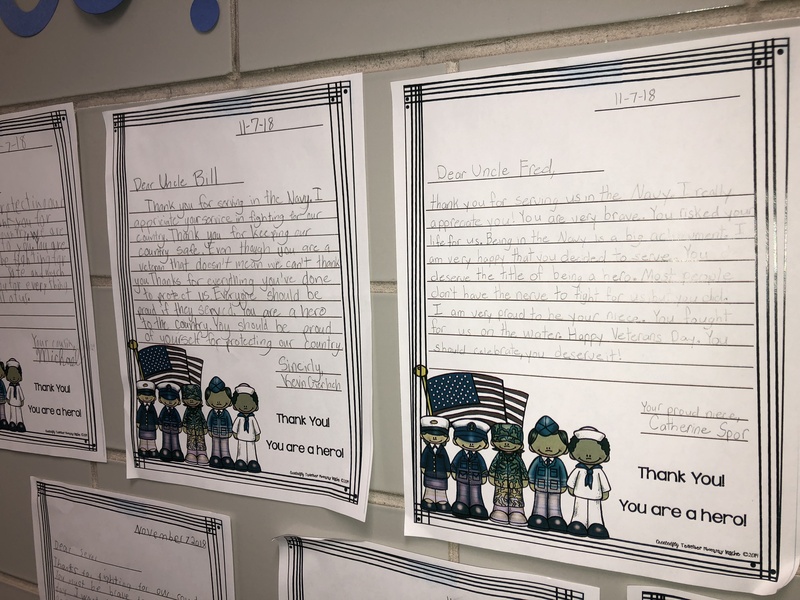 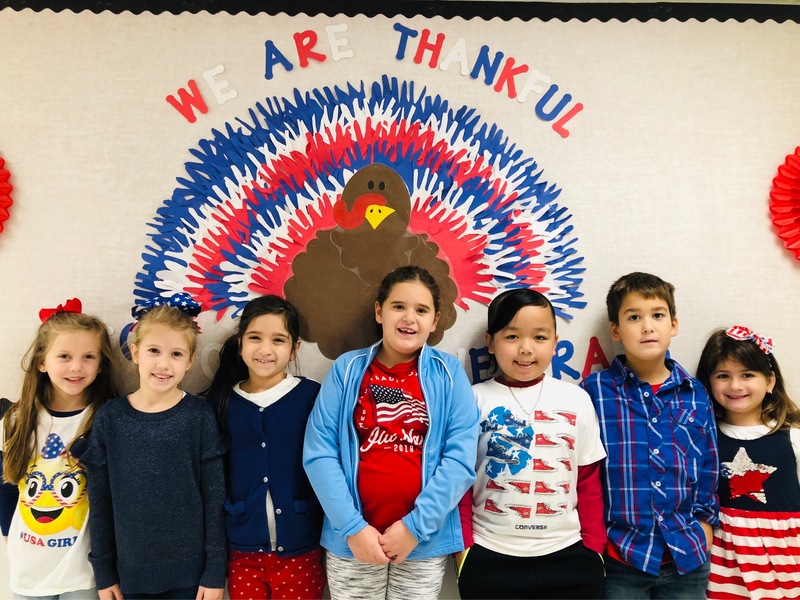 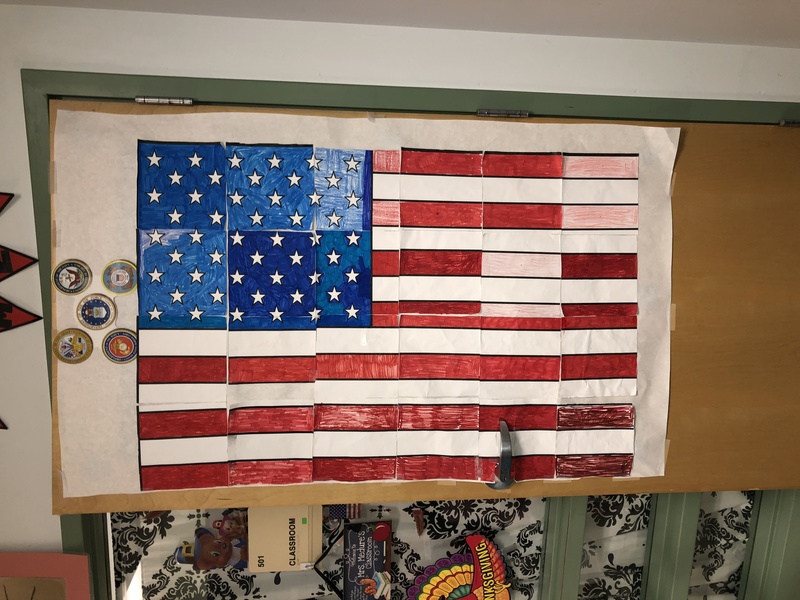 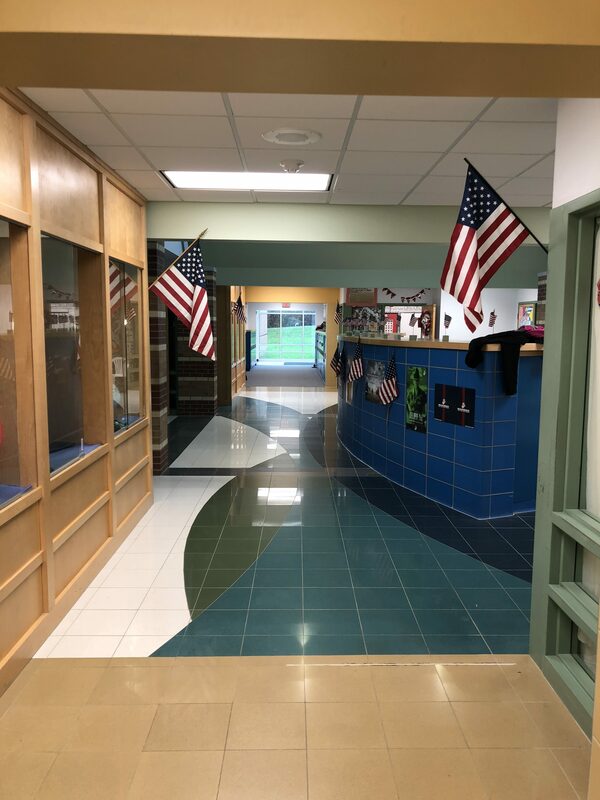 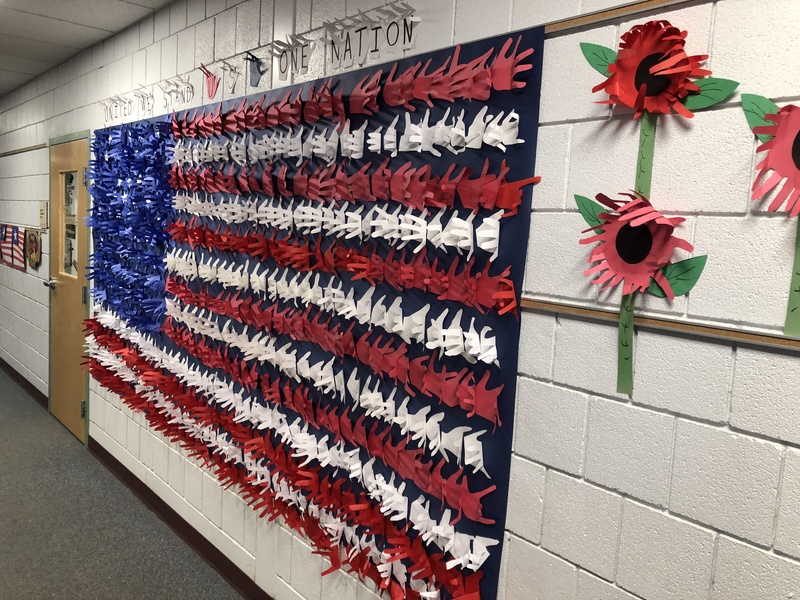 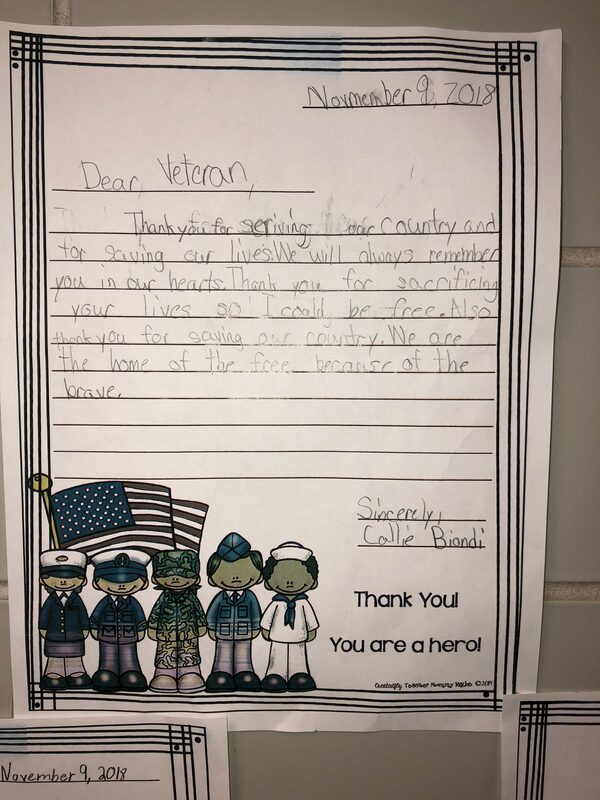 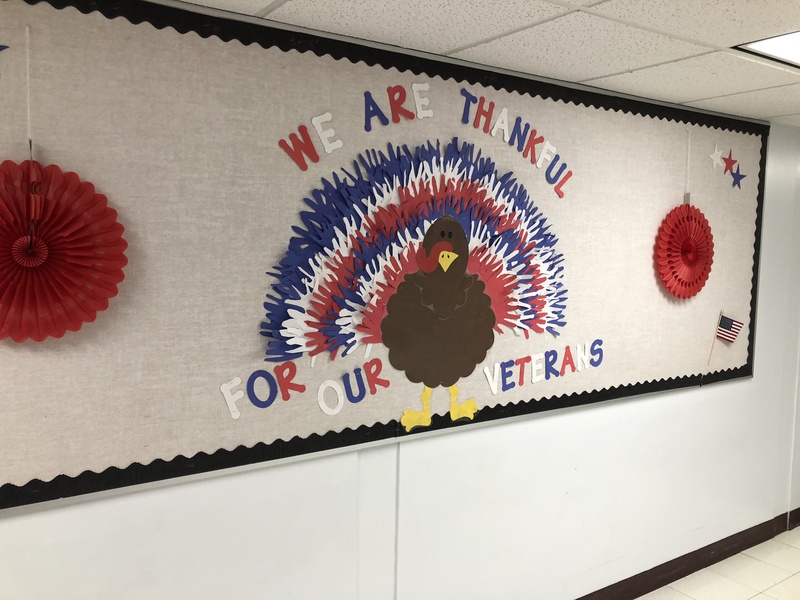 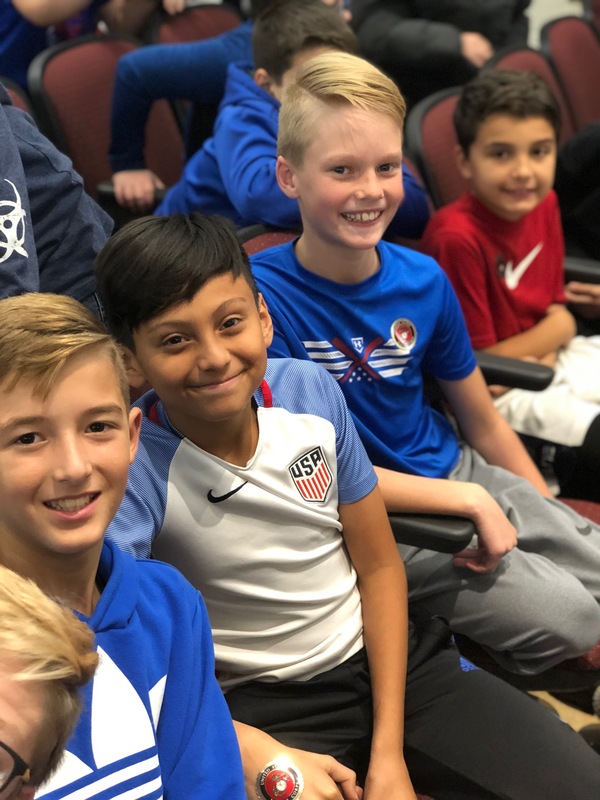 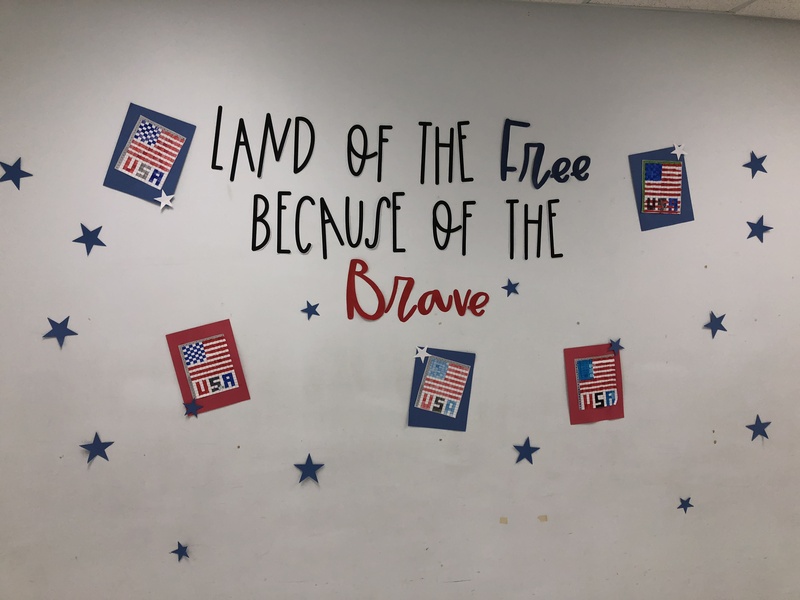 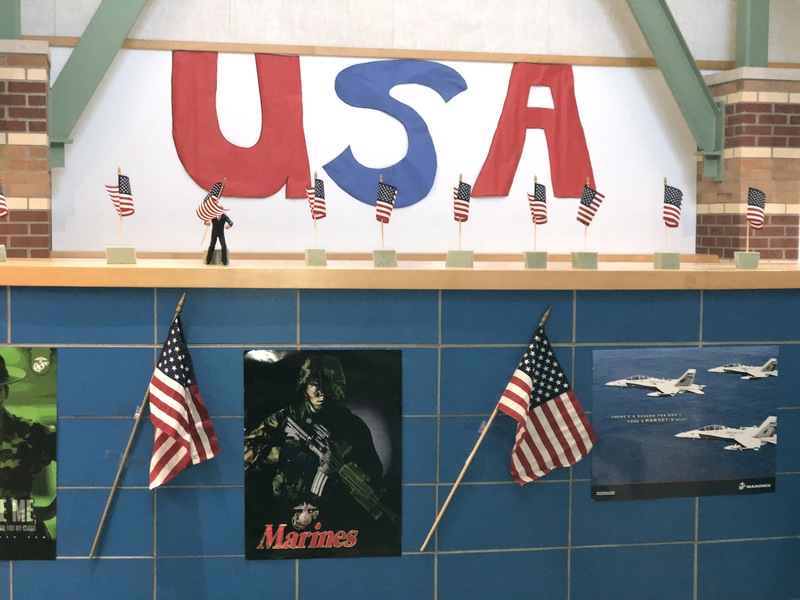 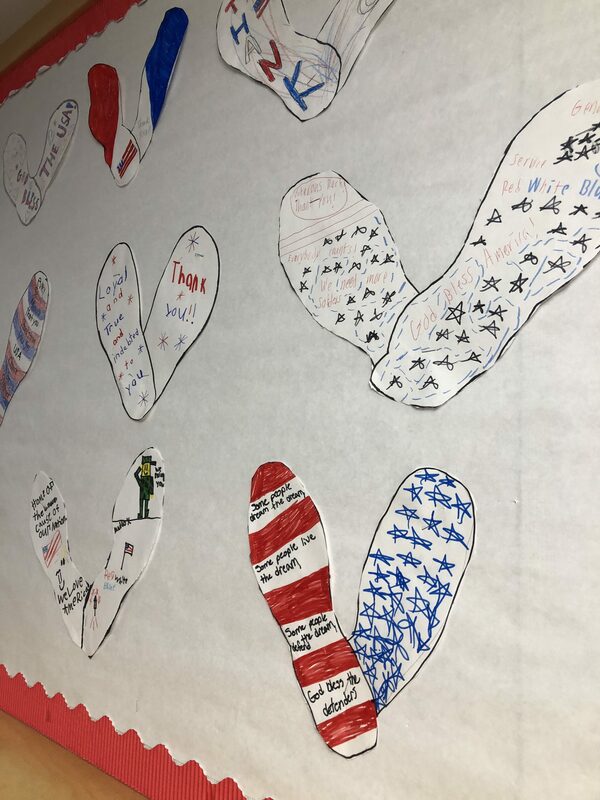 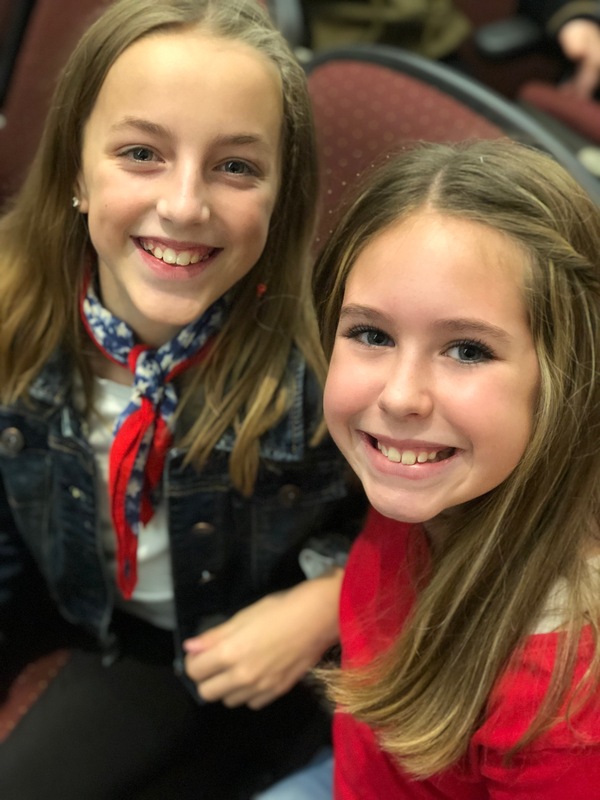 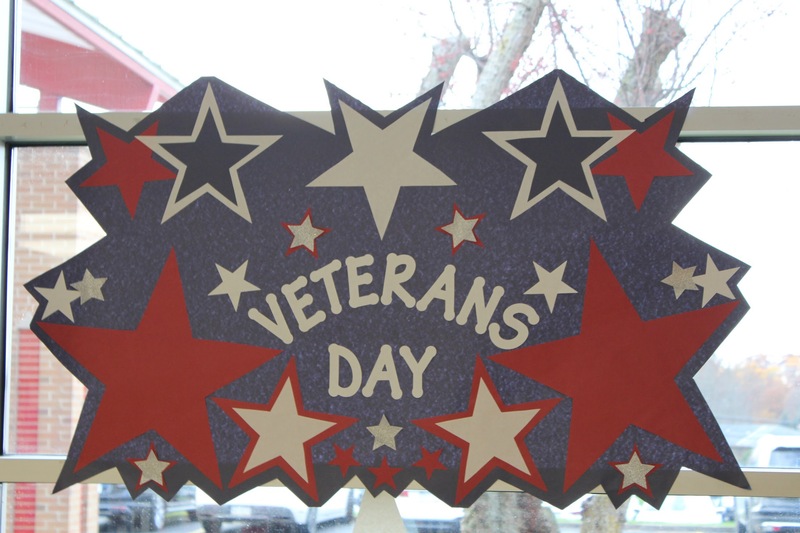 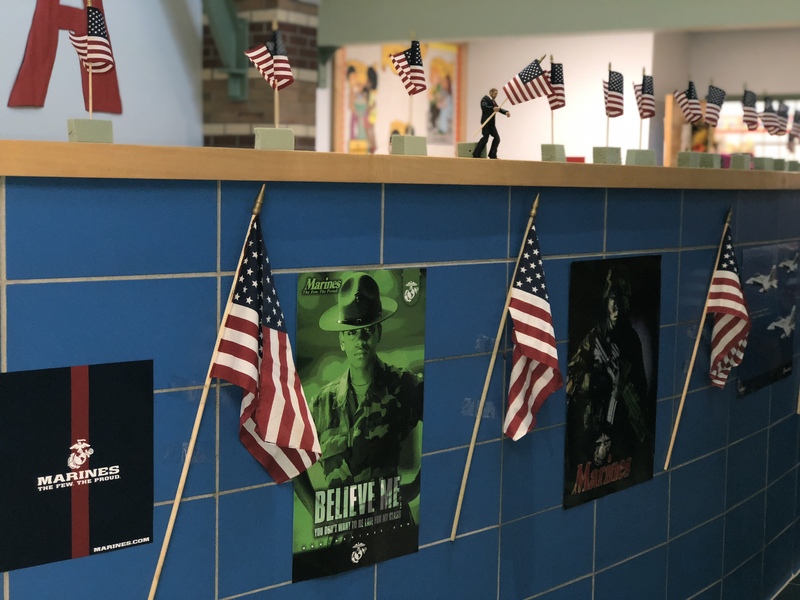 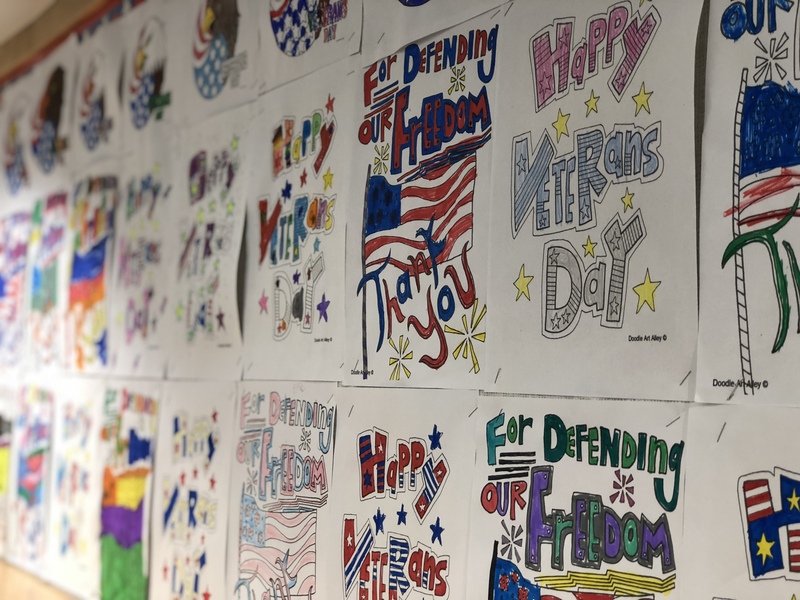 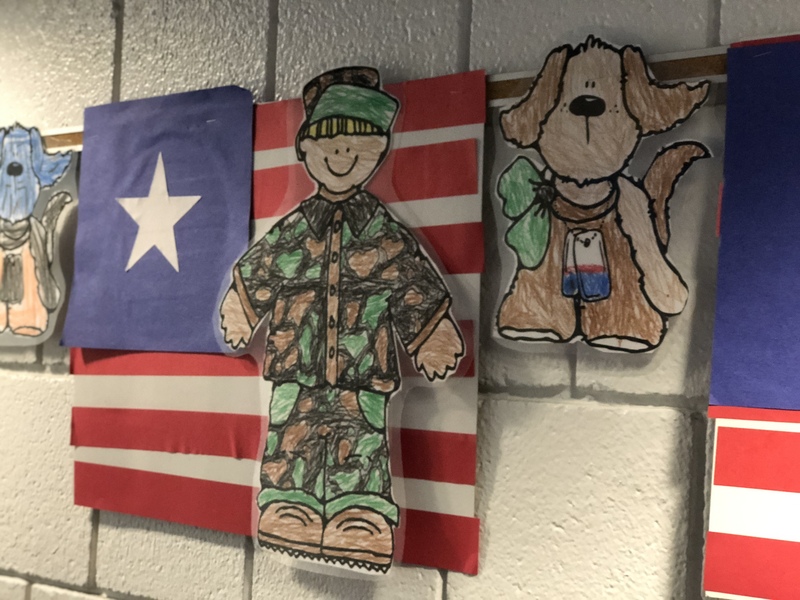 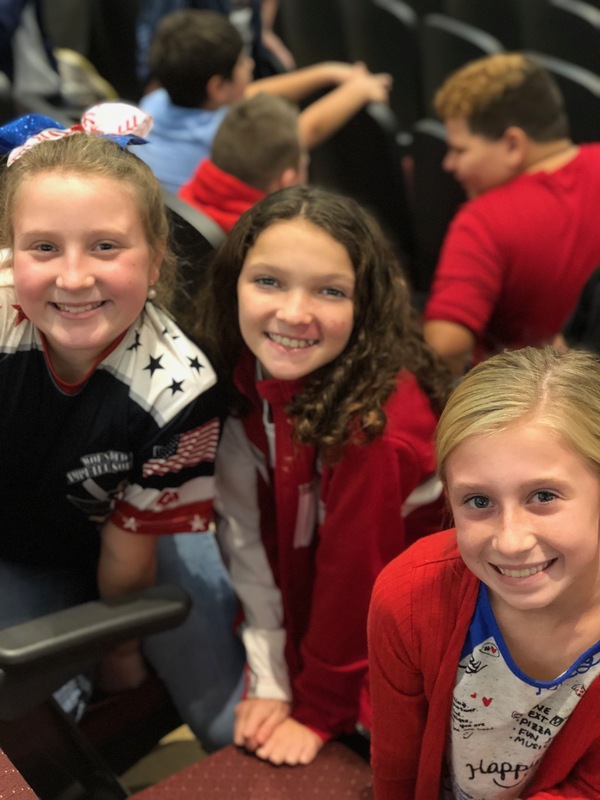 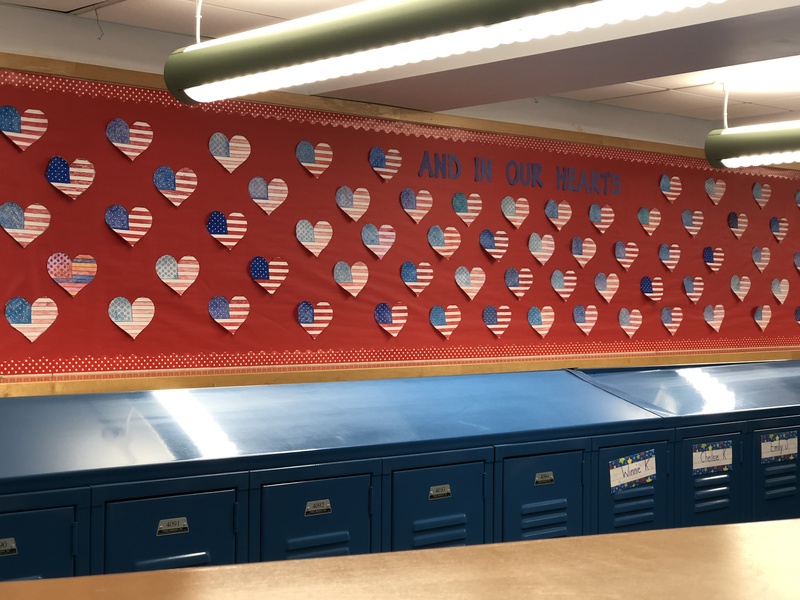 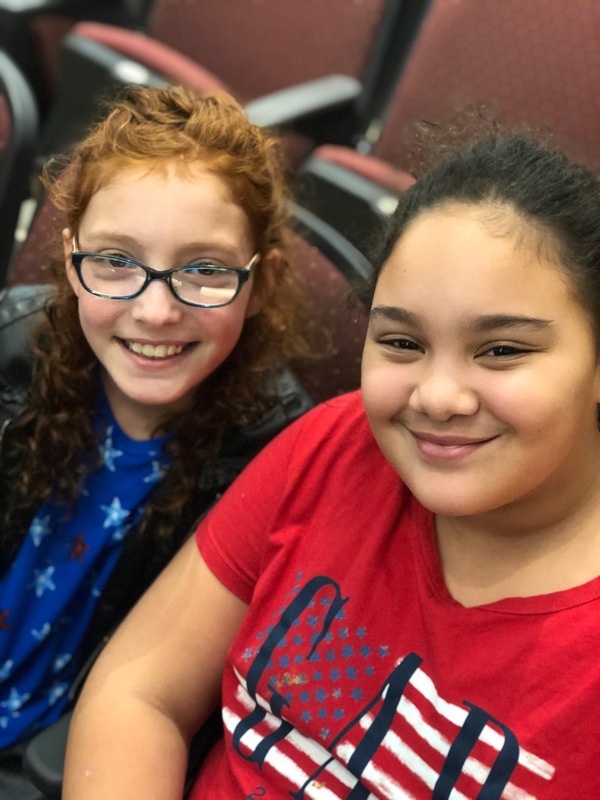 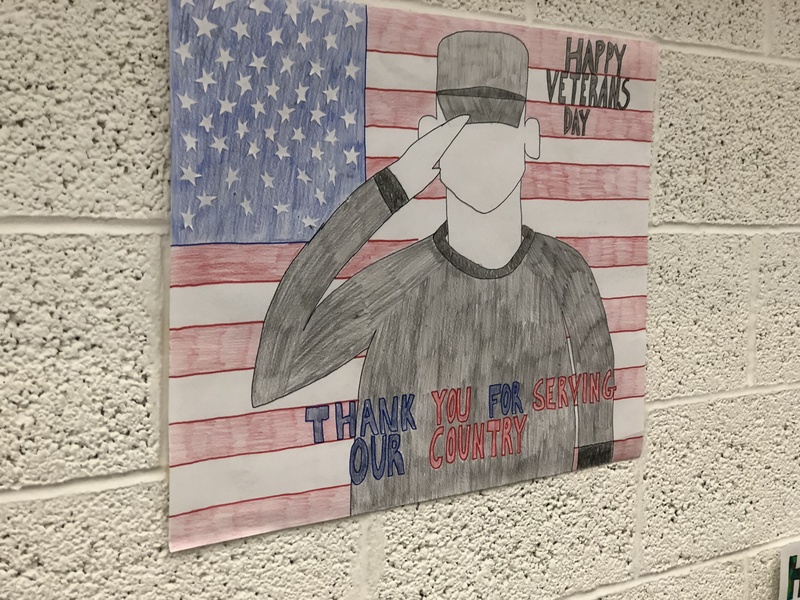 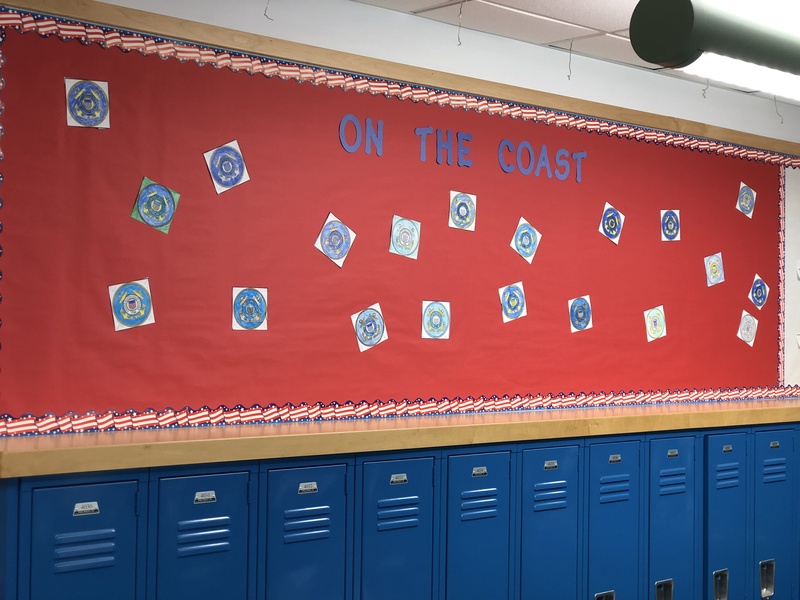 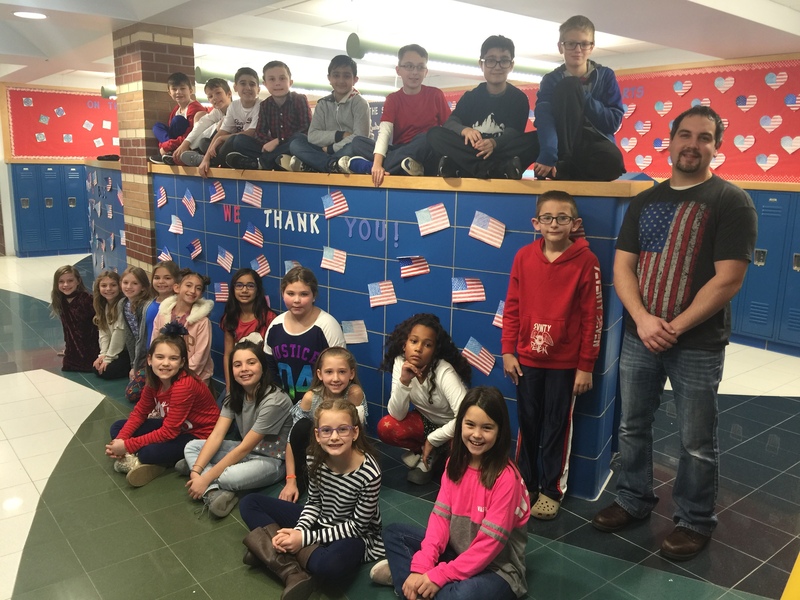 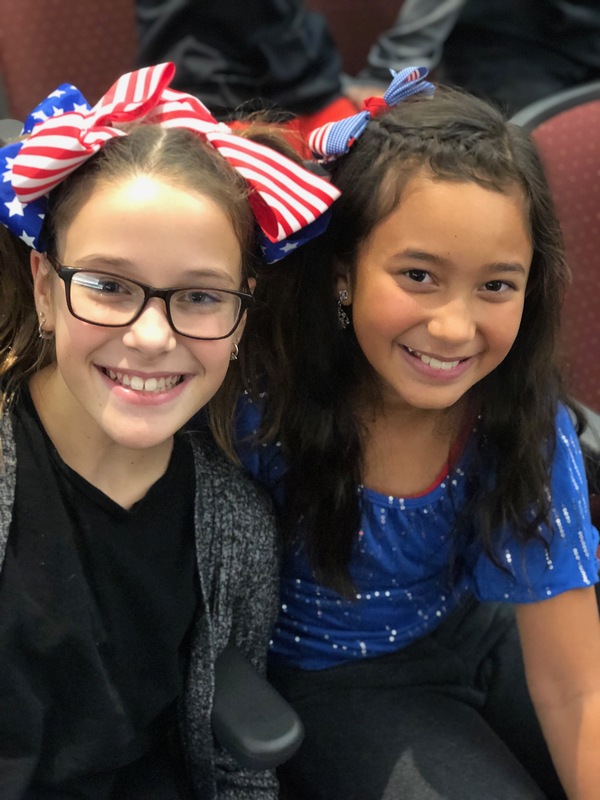 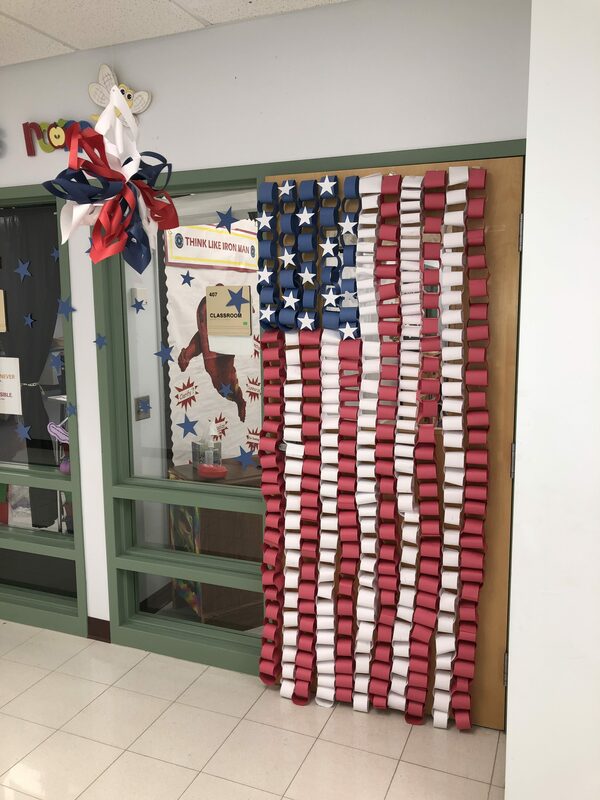 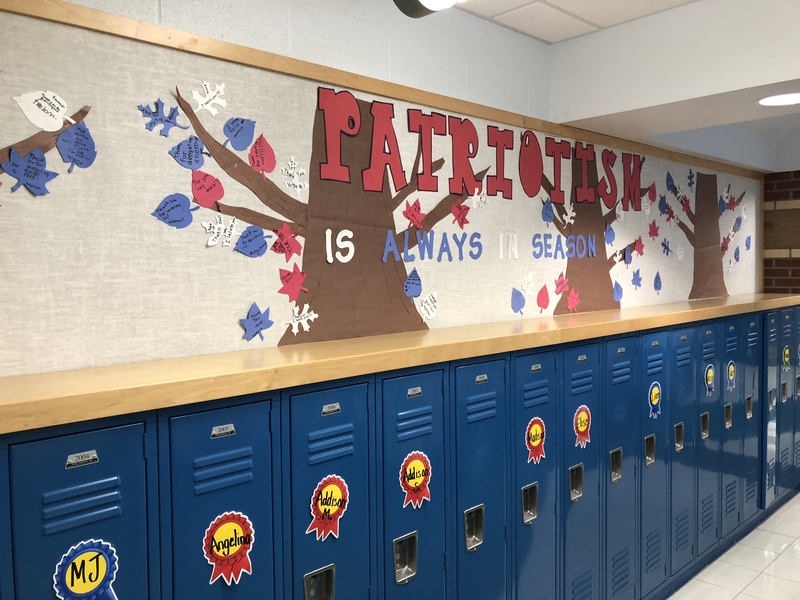 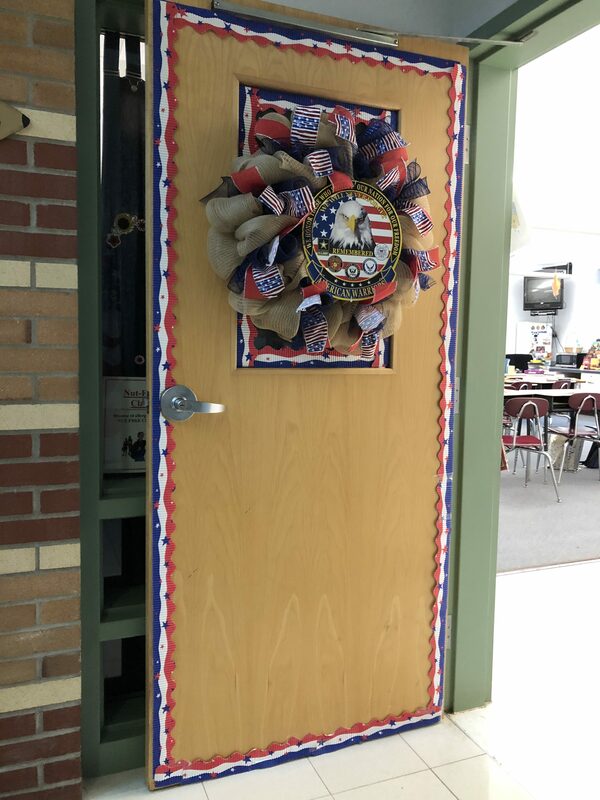 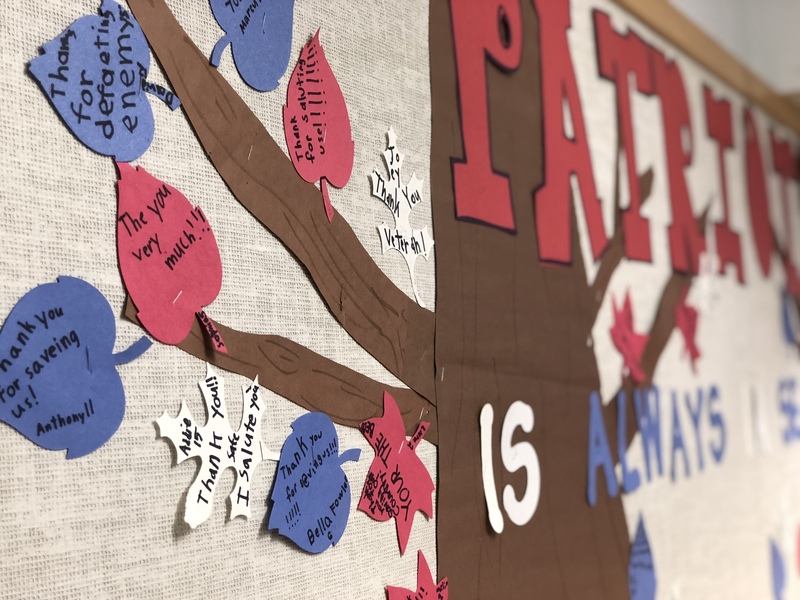 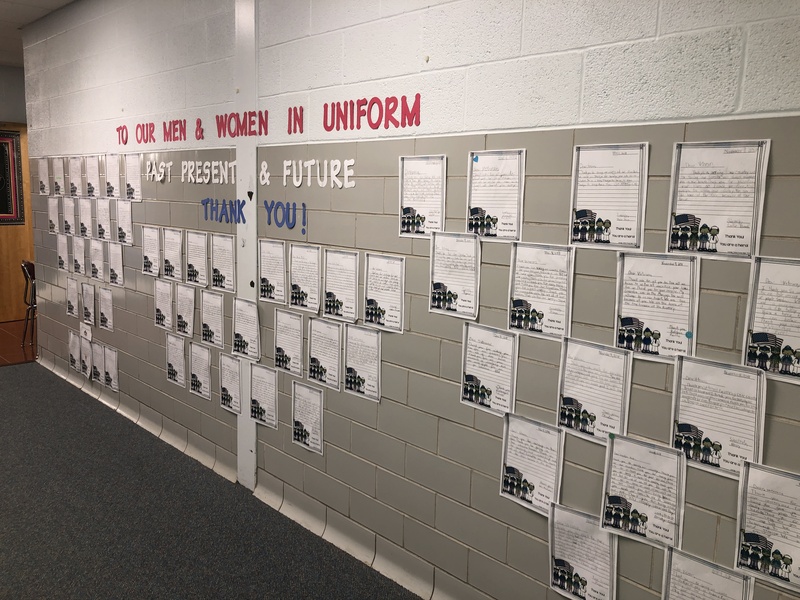 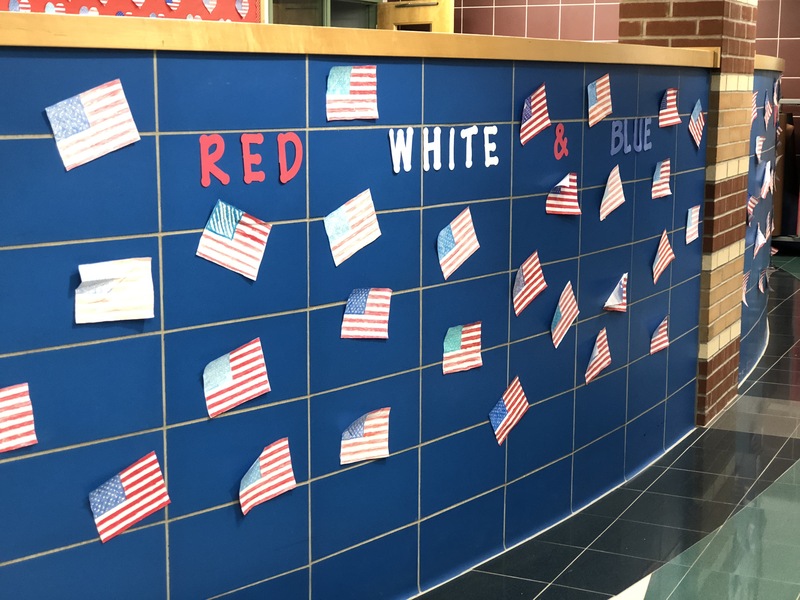 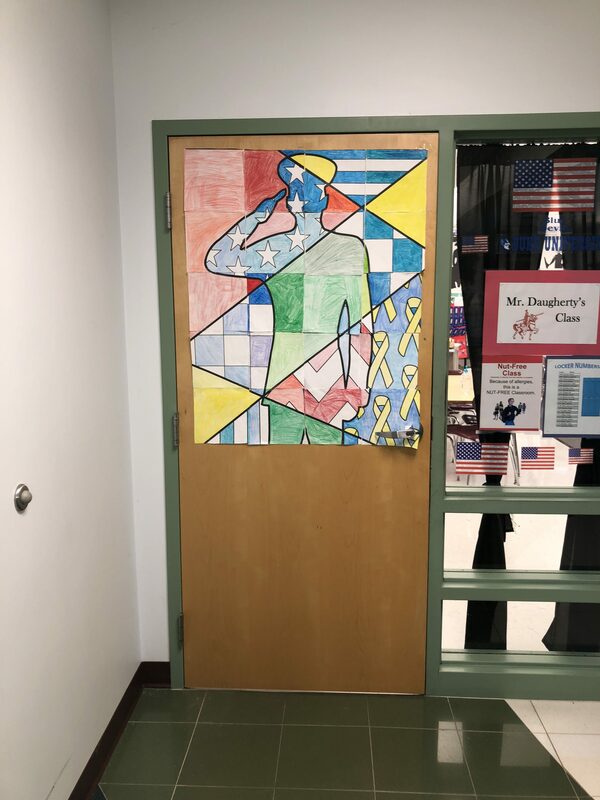 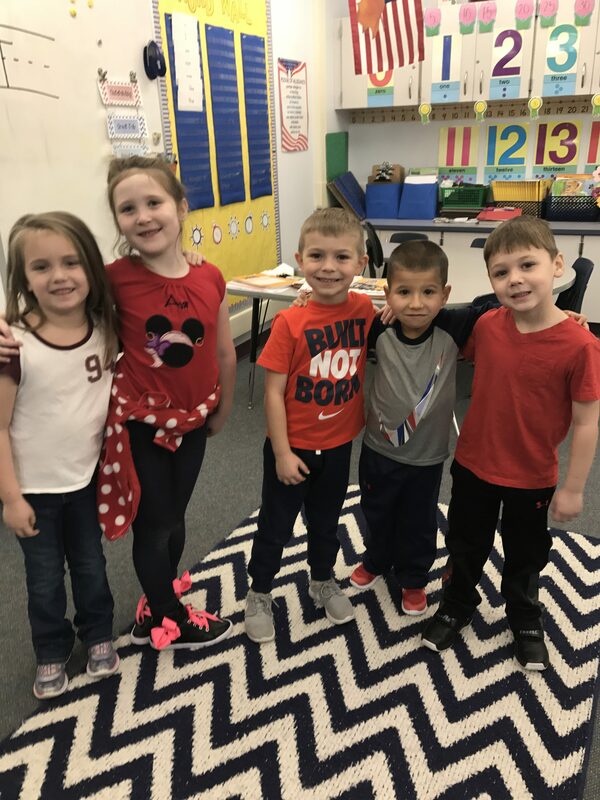 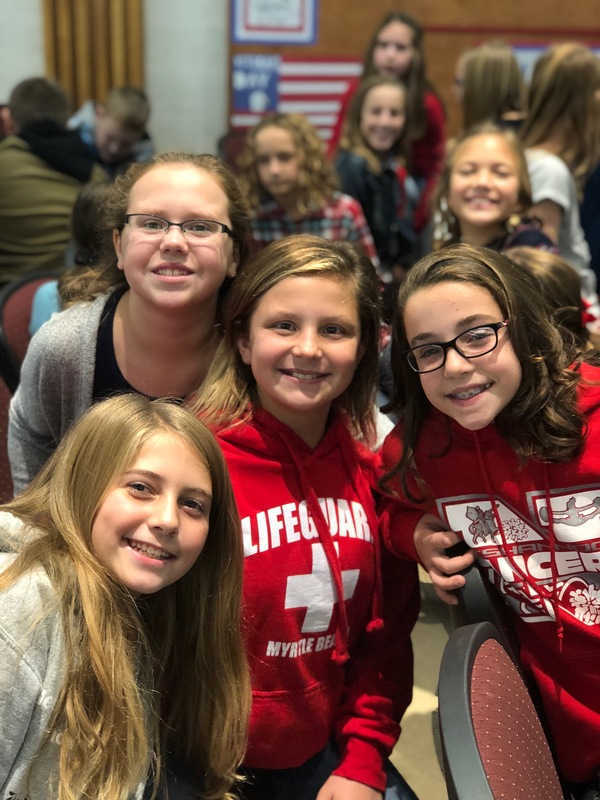 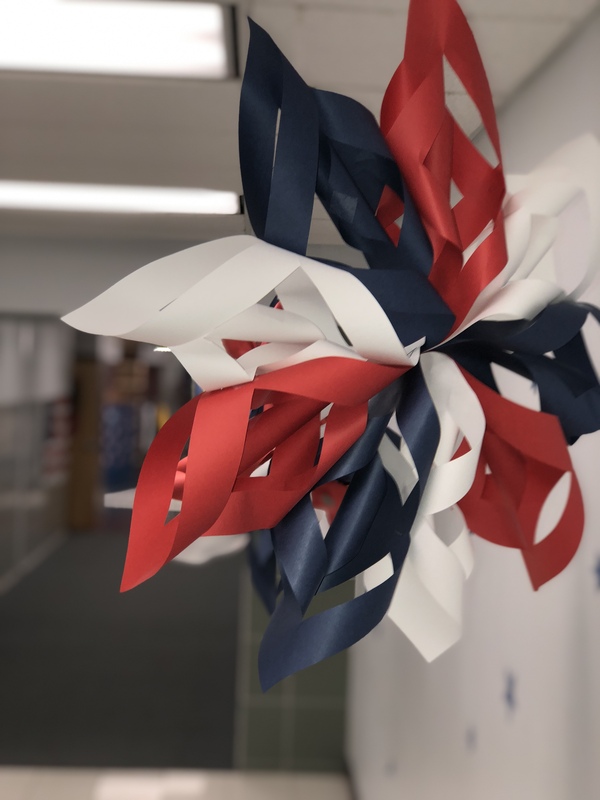 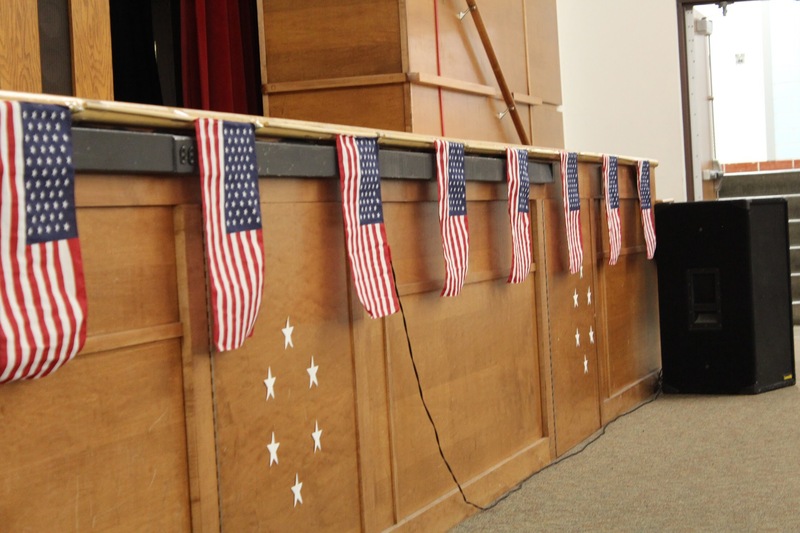 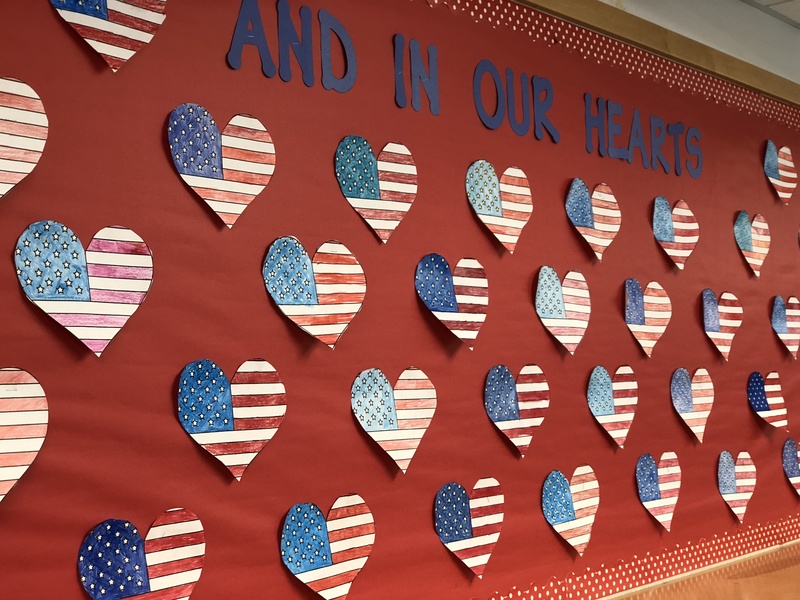 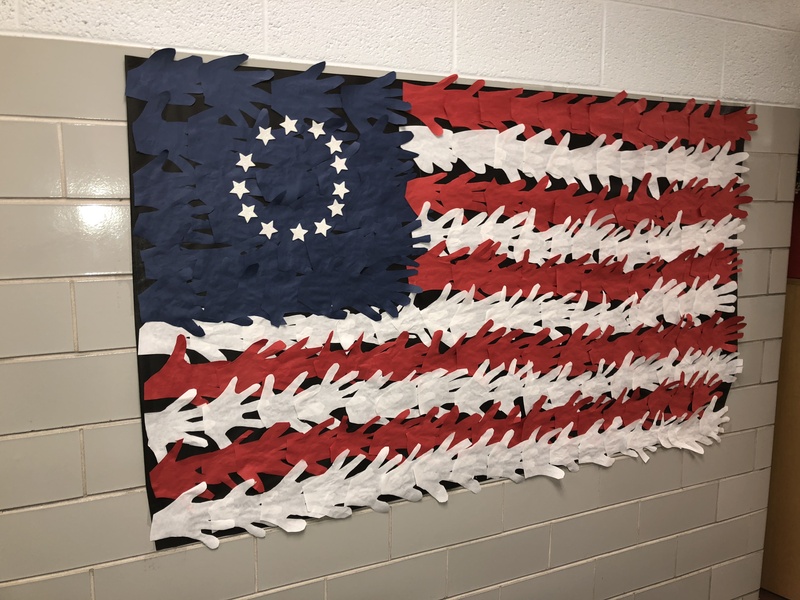 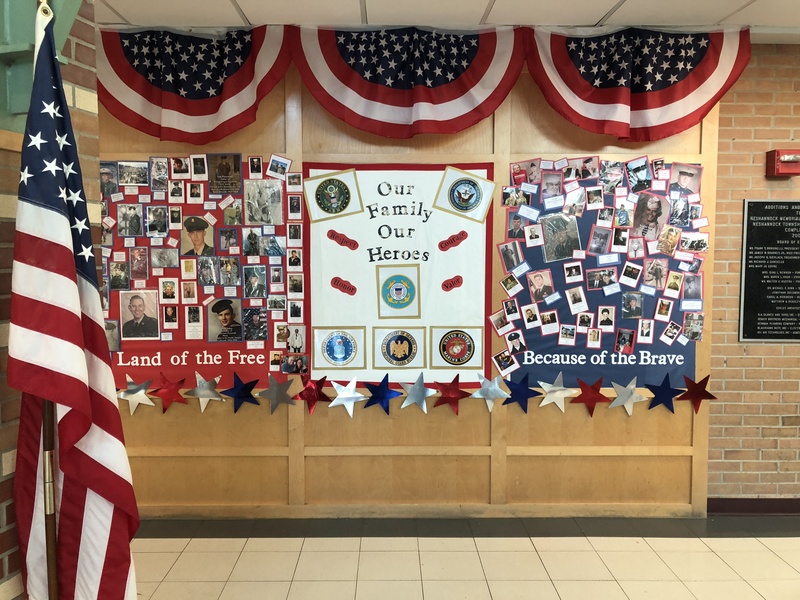 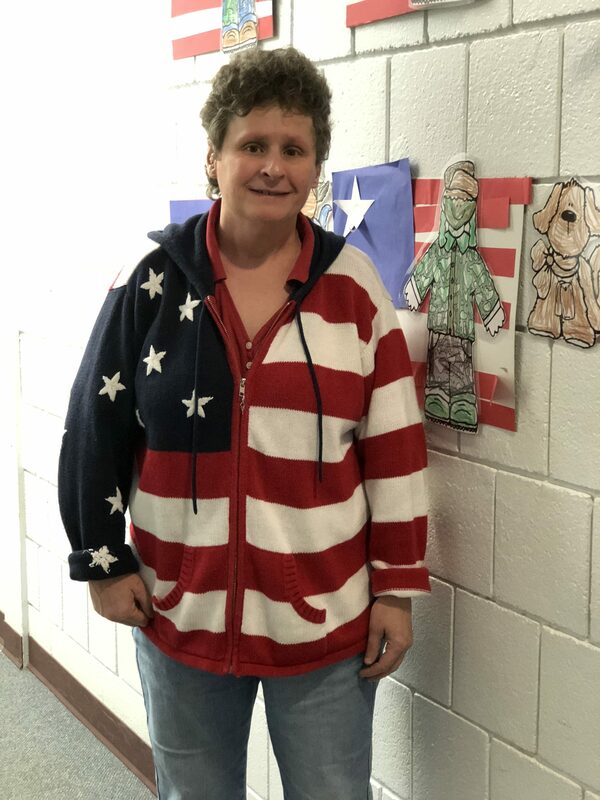 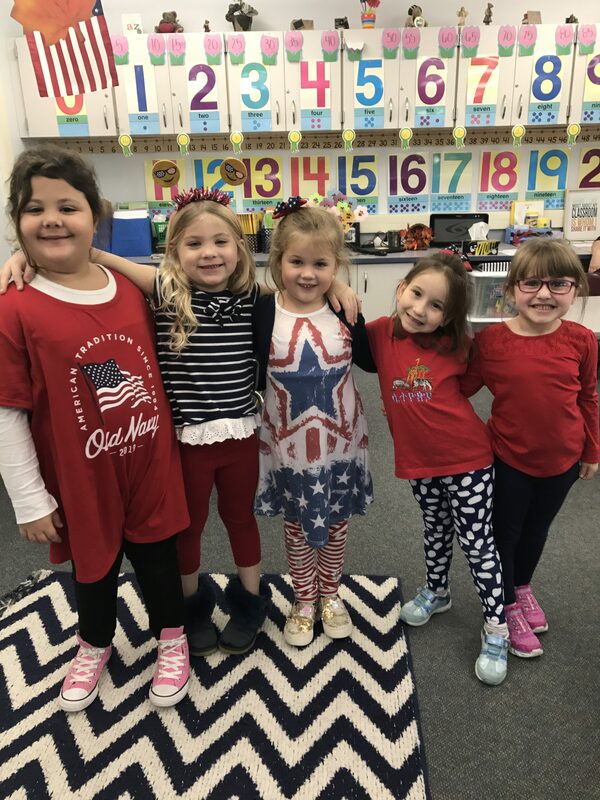 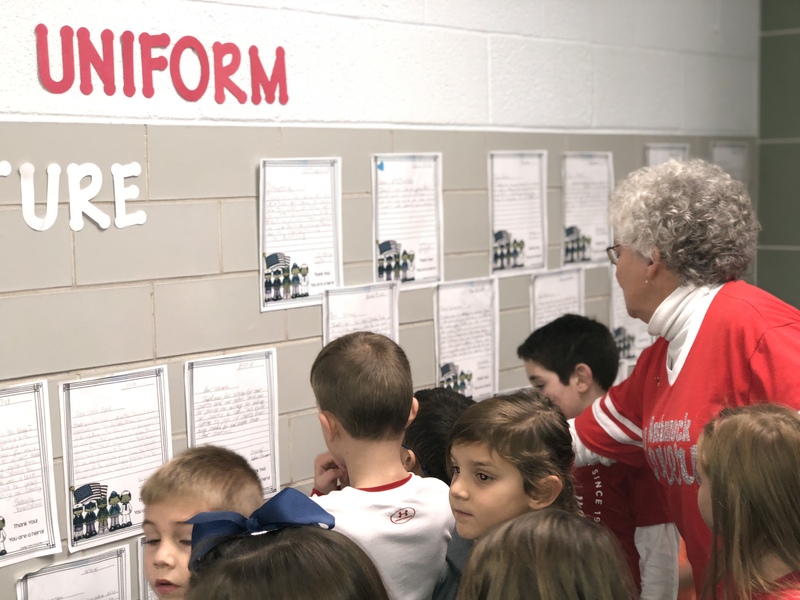 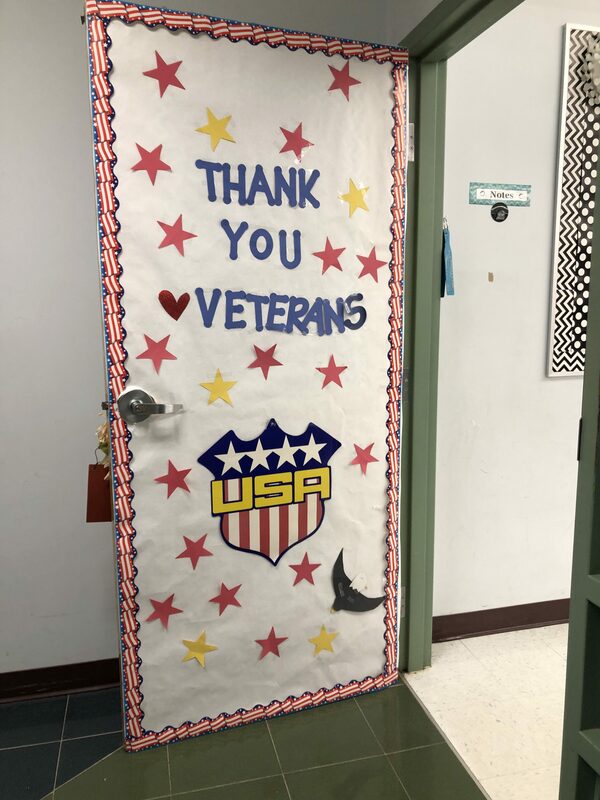 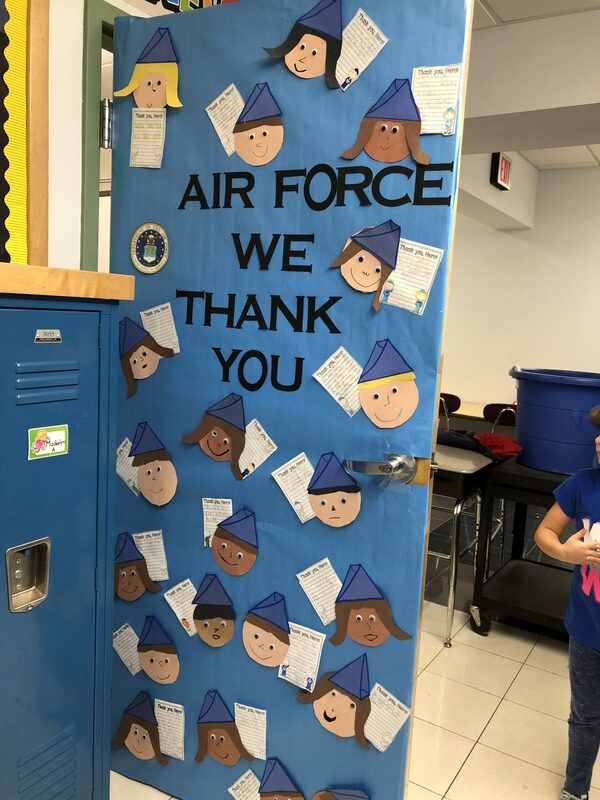 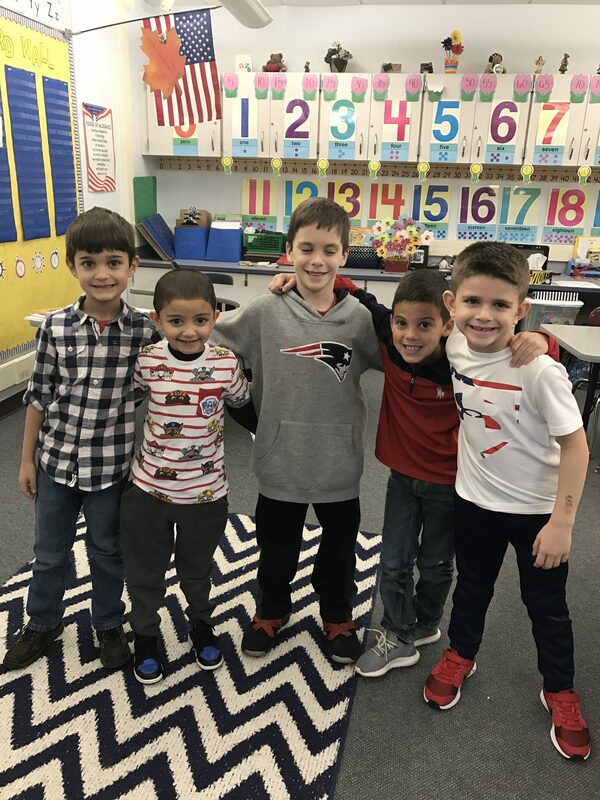 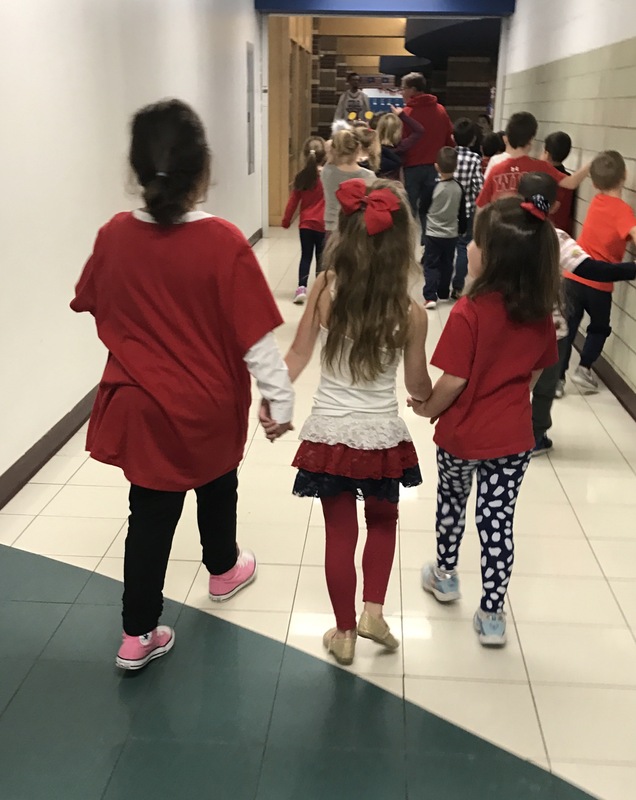 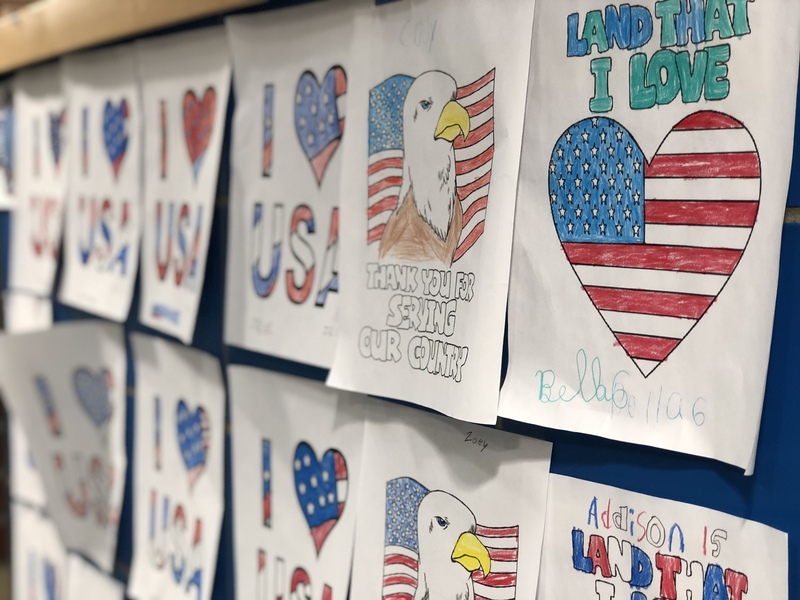 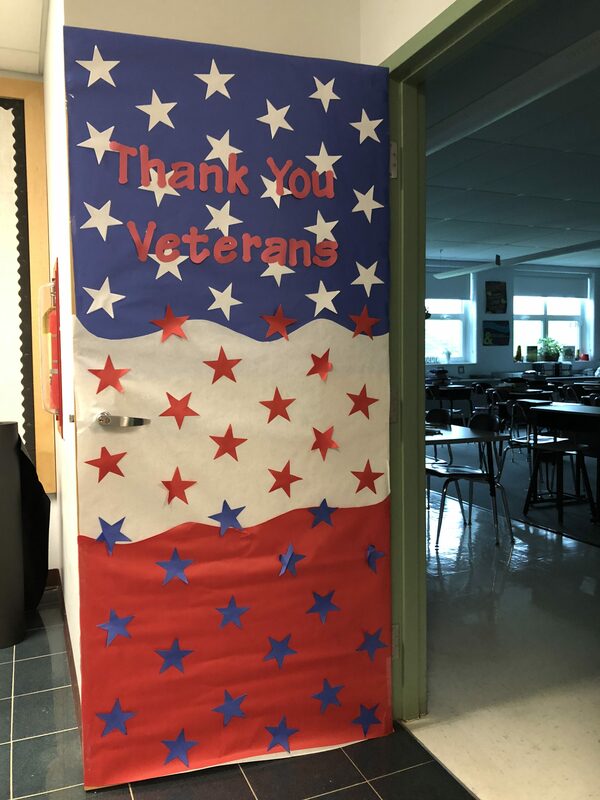 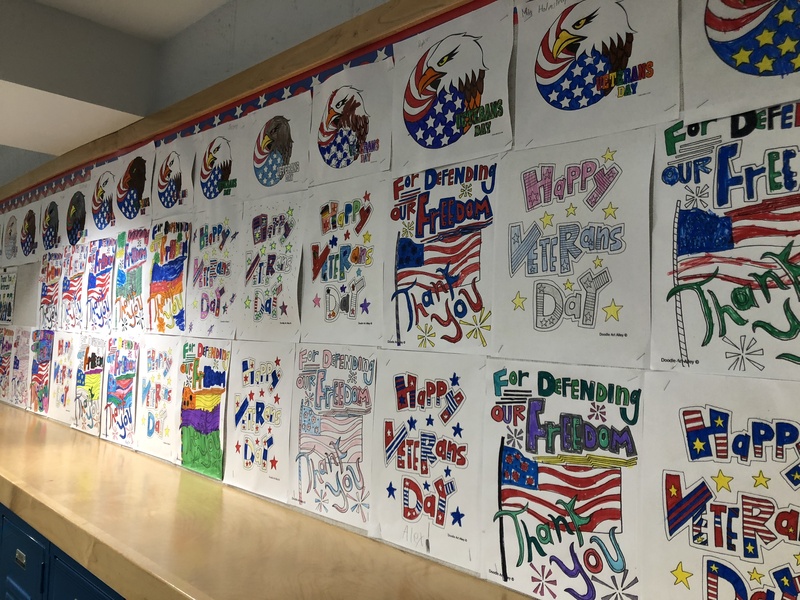 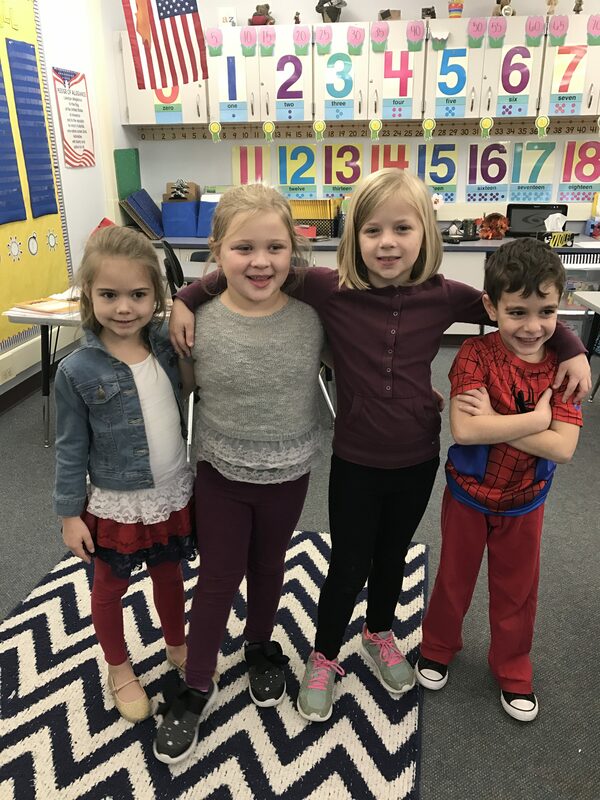 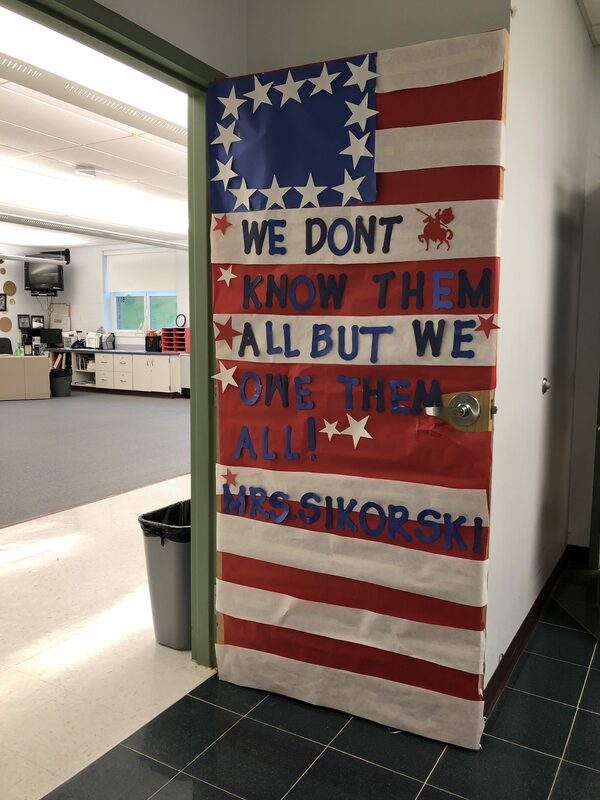 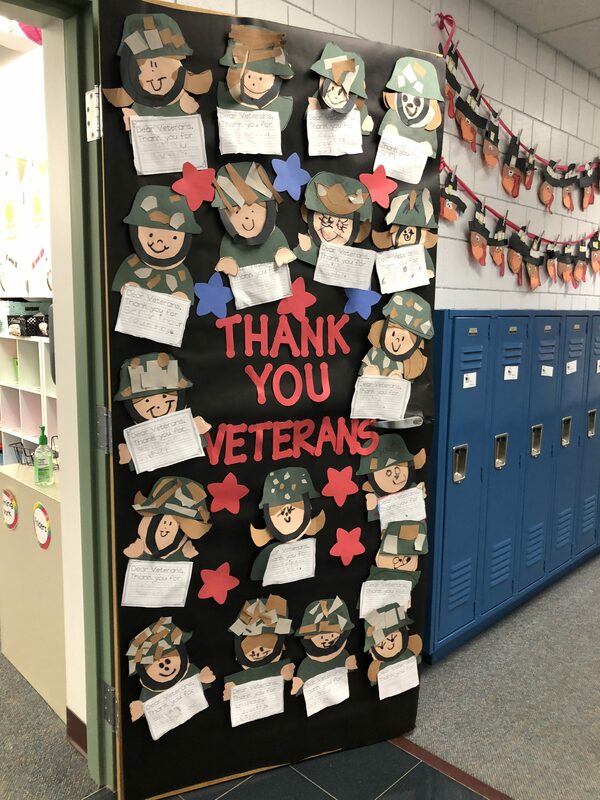 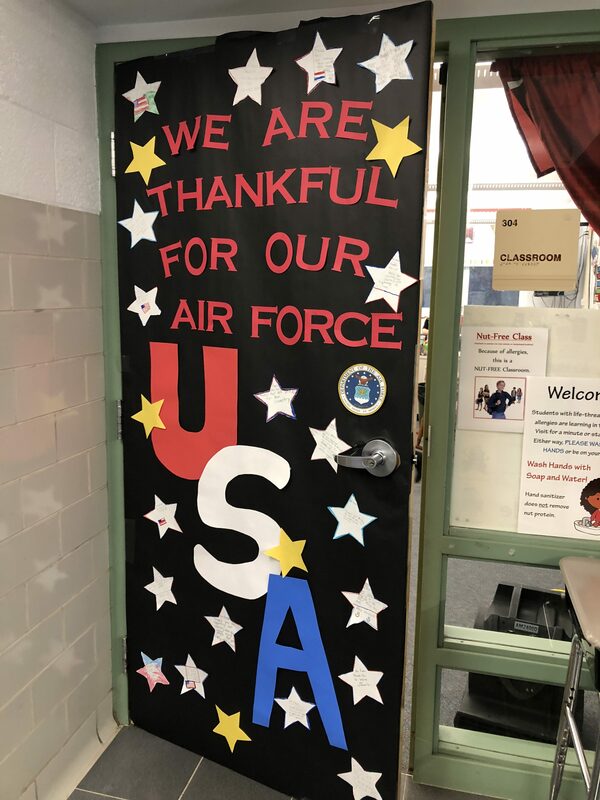 All throughout the halls was a sea of red, white, and blue as students and teachers — Grades K-12 — proudly displayed student work, handmade flags, art work, banners, essays, photos of veterans, and thank you letters. 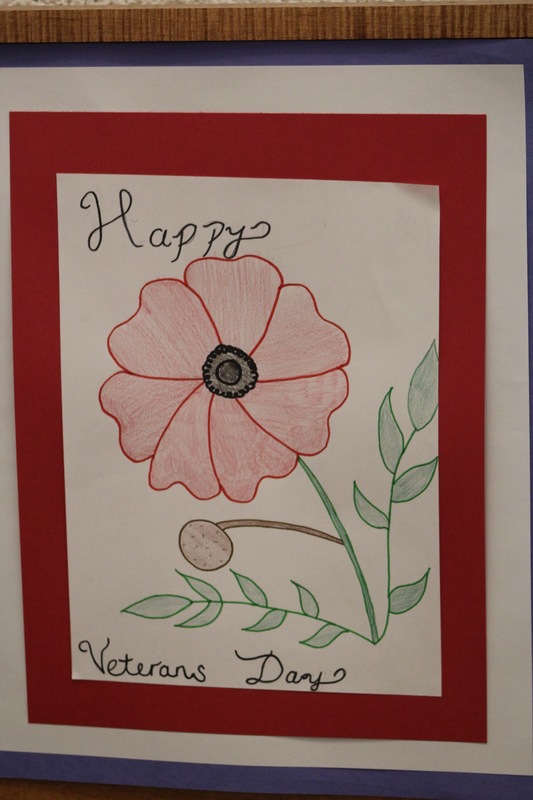 It was a remarkable sight to see and wonderful expression of gratitude to our veterans. 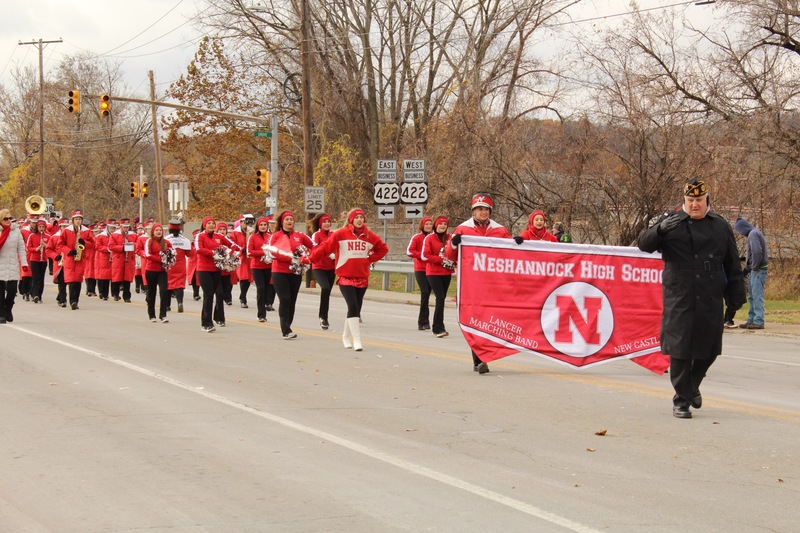 Student gratitude for veterans continued into the weekend as several student groups and individuals participated in the Annual Veterans Day Parade throughout Downtown New Castle. 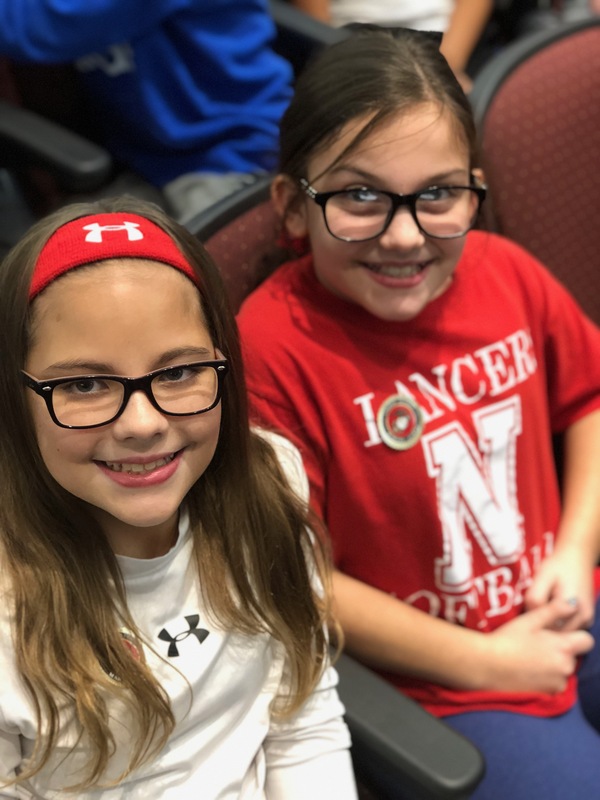 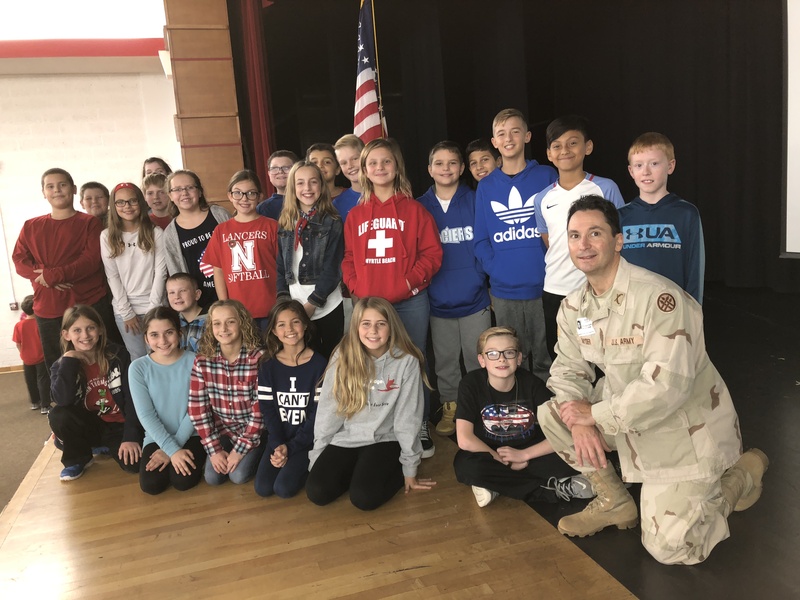 The National Honor Society organized the Annual Veterans Day Appreciation Program, on November 8, 2018, at the Jr./Sr. 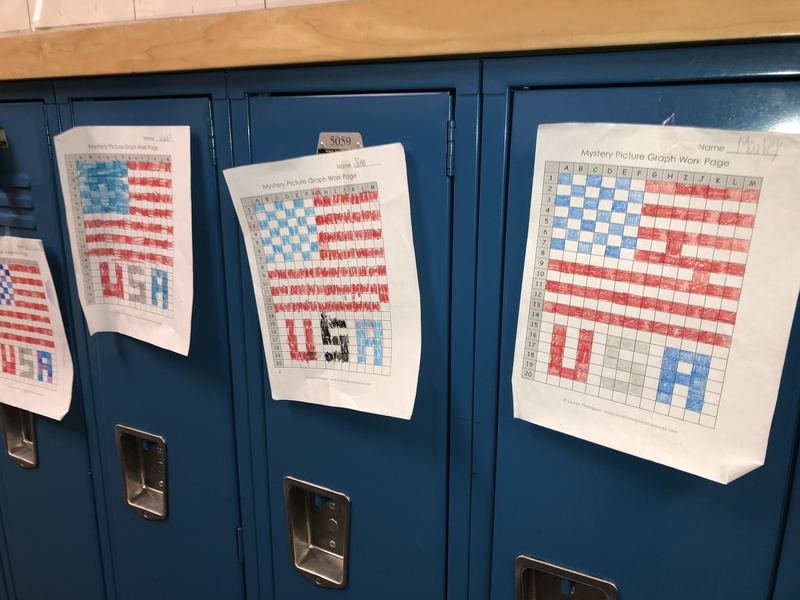 High School. 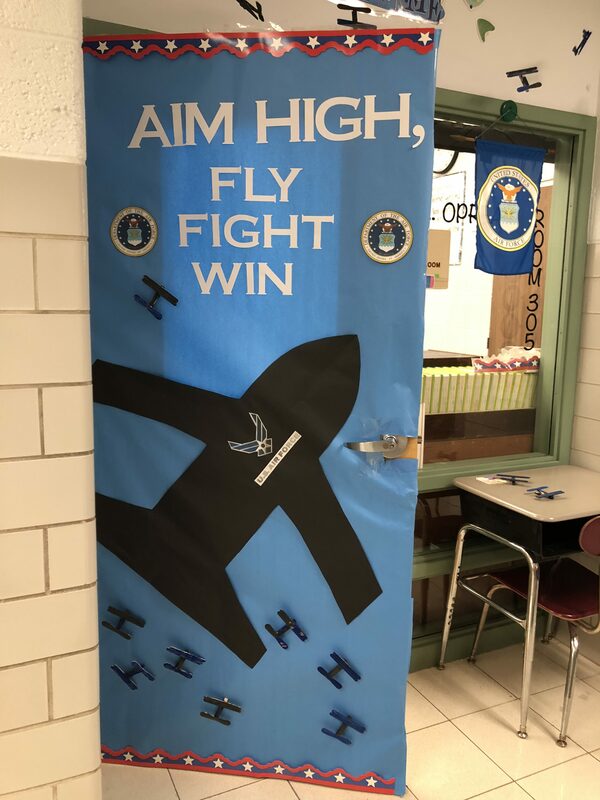 Msgt. 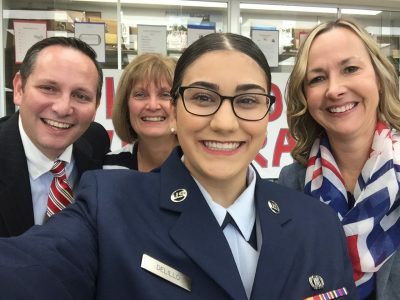 Lori DeLillo, USAF, E-1 Airman Justina DeLillo, USAF, Gunney Sgt. 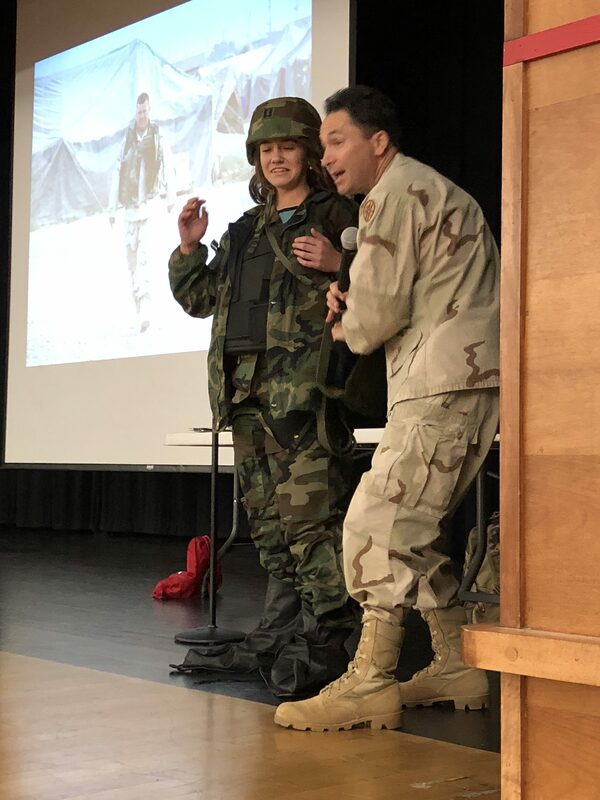 Michael Kaufman, USMC, and Sgt. 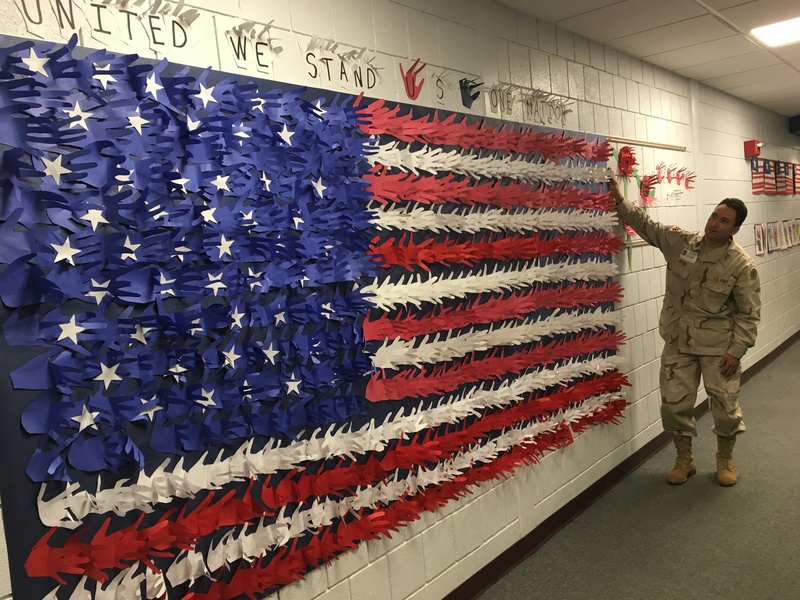 Zachary Knowlton, USMC, assisted NHS students in leading the Pledge of Allegiance. 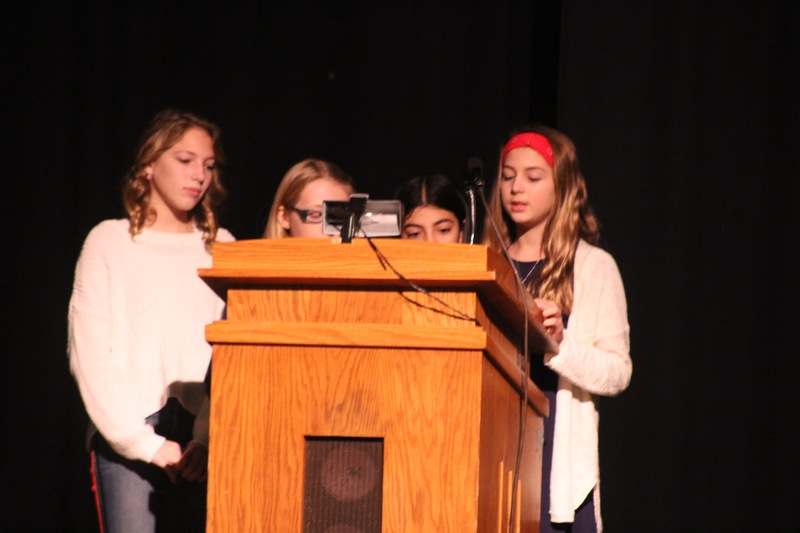 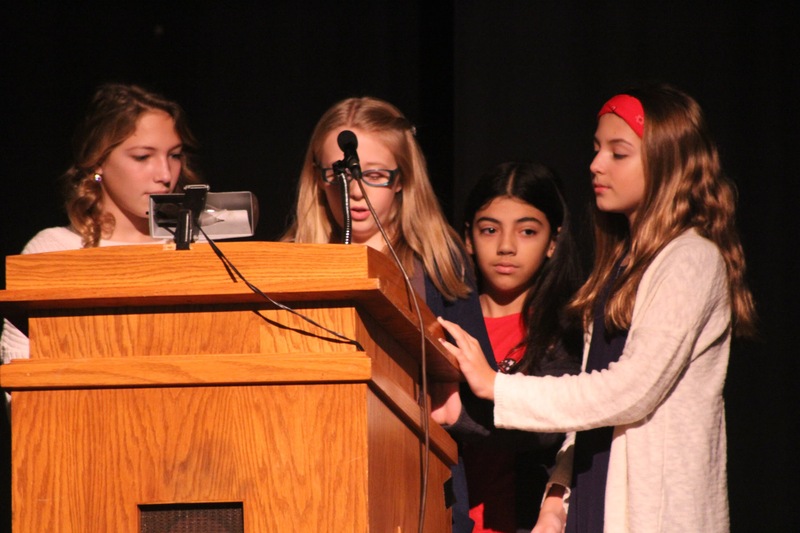 After the Presentation of the Colors, led by Neshannock Color Guard, Pledge of Allegiance and the “Star Spangled Banner,” sung by Leah Buczek and Christina Cardenas, historical and symbolic aspects of Veterans Day were explained and student essays were read. 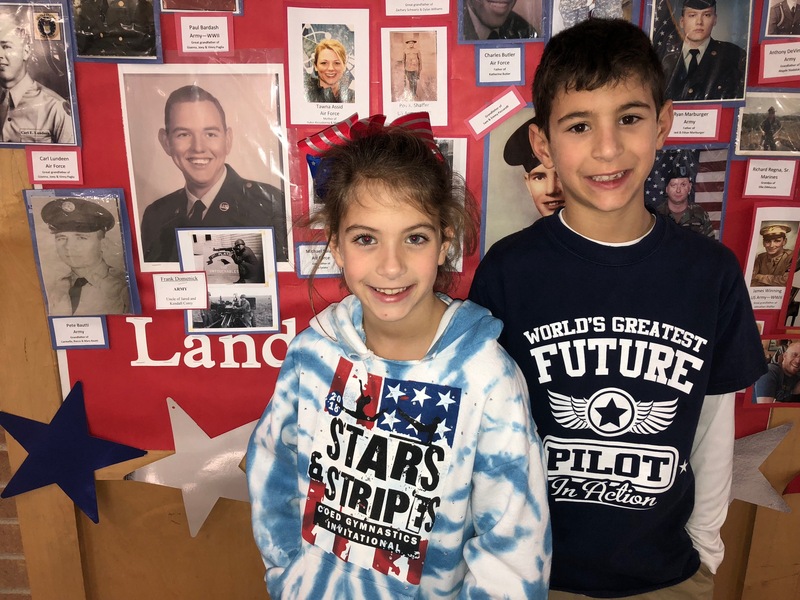 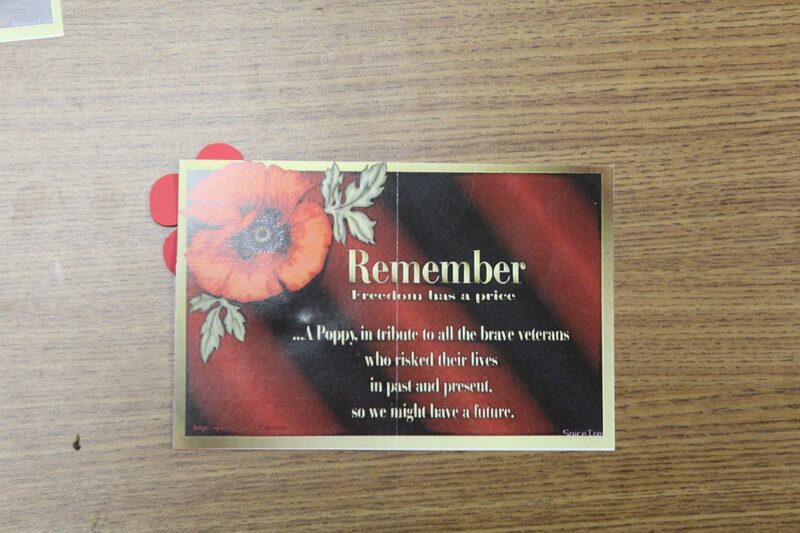 Tori Gouza presented the history of Veterans Day before Liam McGann presented the meaning of the poppy. 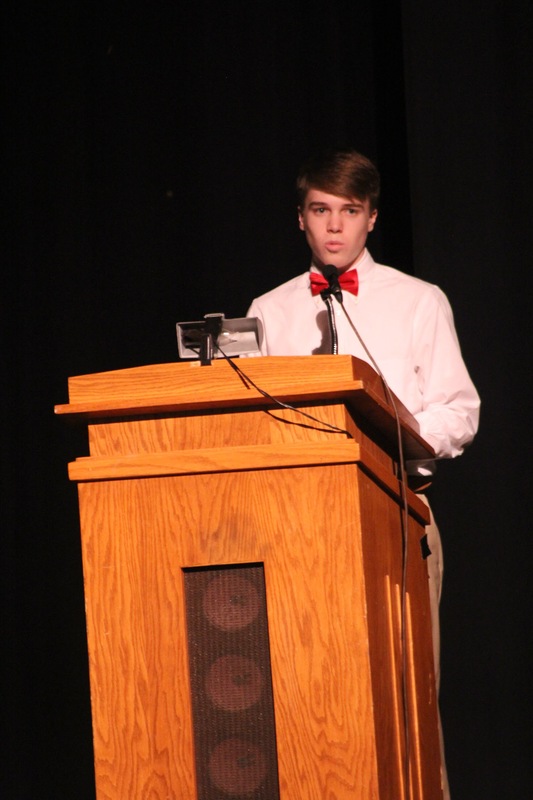 Nico Johnson introduced the guest speaker, Captain Jake Tappe, US Army. 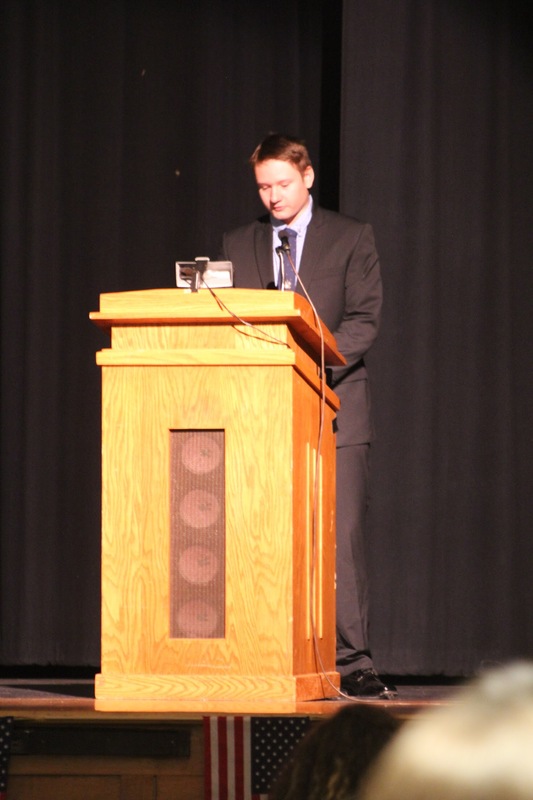 Captain Tappe, NHS Class of 2009, addressed all in attendance via recorded video. 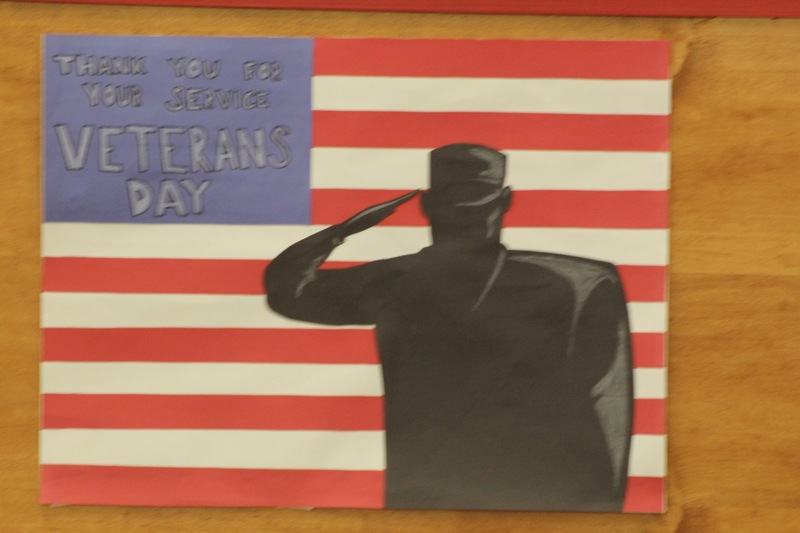 The program closed with the playing of “Taps” and the Retiring of the Colors. 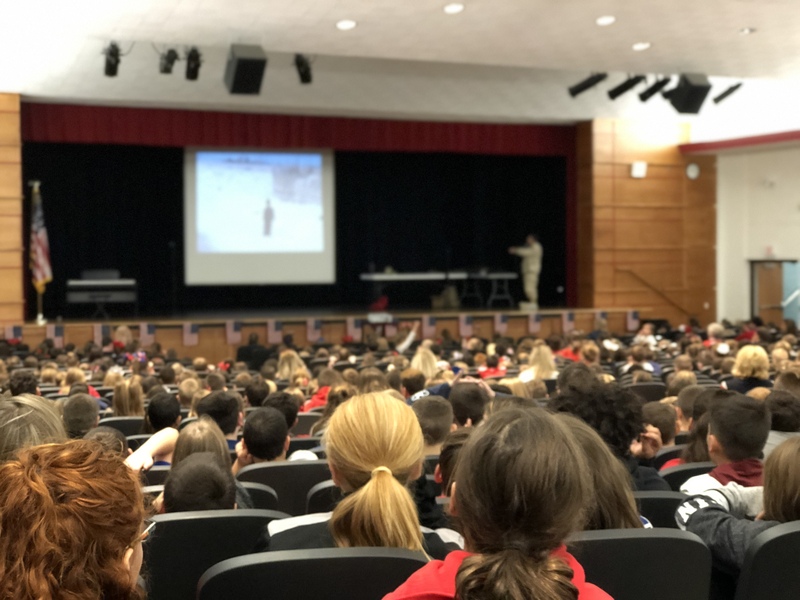 Special thanks to all who participated — Veterans, Honor Guard, Teachers, Students, Lancer Marching Band, and Choir — for making it such a special day. 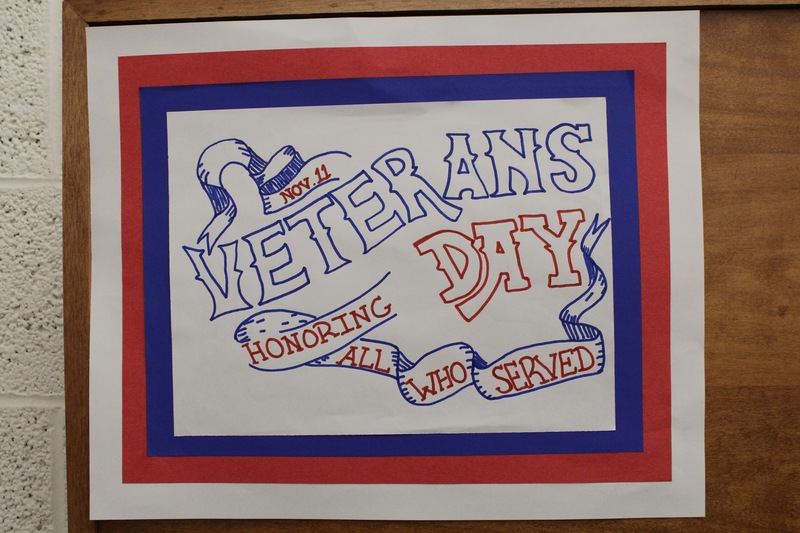 The ceremony, attended by over 700 people, was a memorable “thank you” for all those who serve and have served. 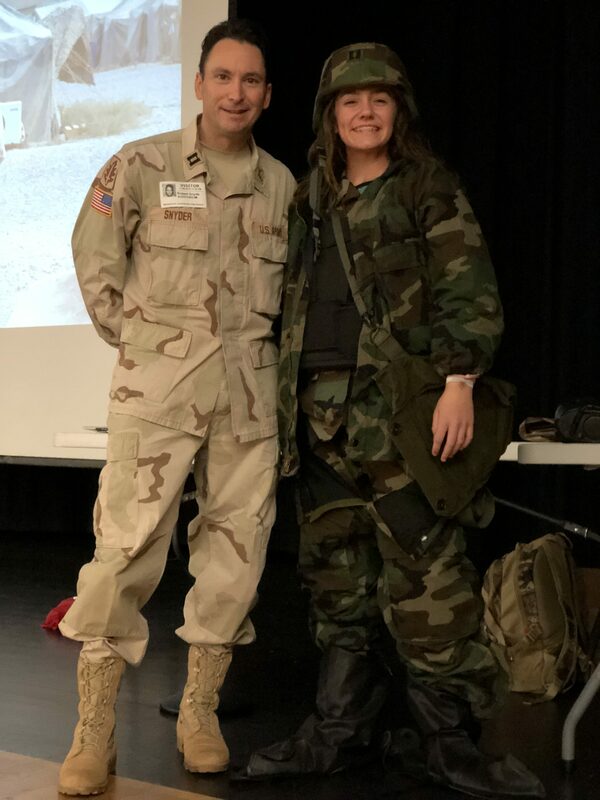 Dr. Snyder and Sophia Tinstman, sixth grade student, pose for a picture as she sports the heavy layers of combat gear worn by Dr. Snyder in Iraq. 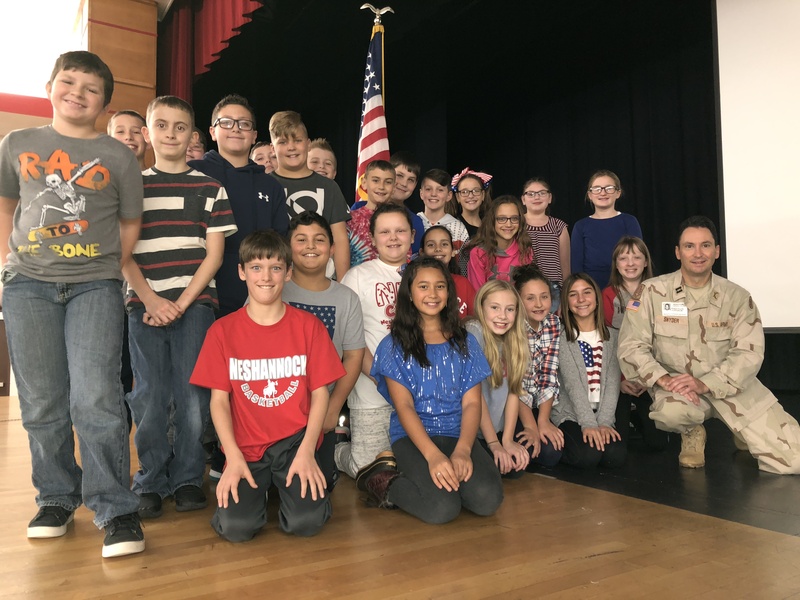 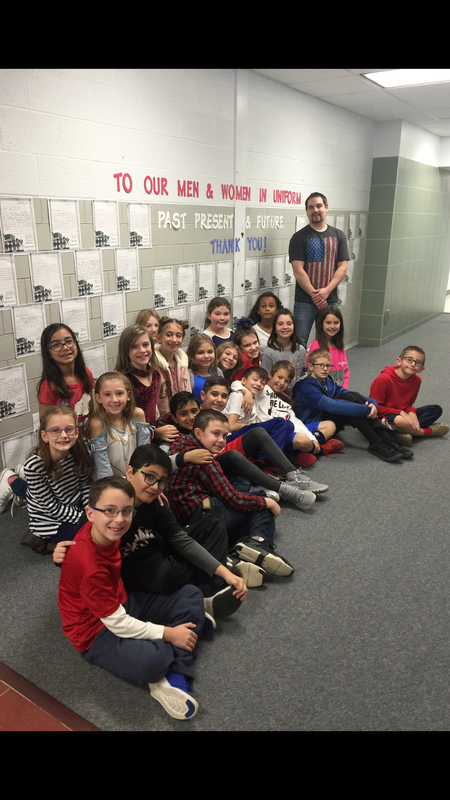 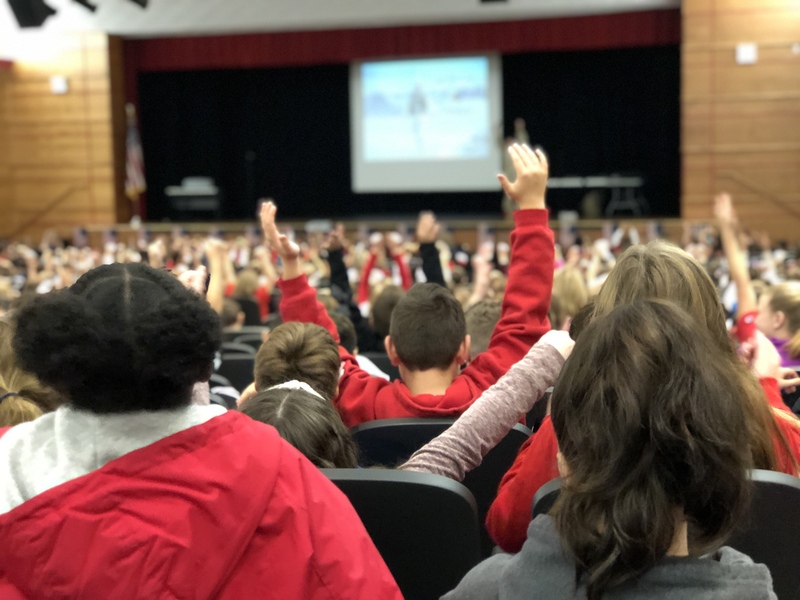 Students at Neshannock Memorial Elementary School welcomed Dr. Robert Snyder for a Veterans Day author visit. 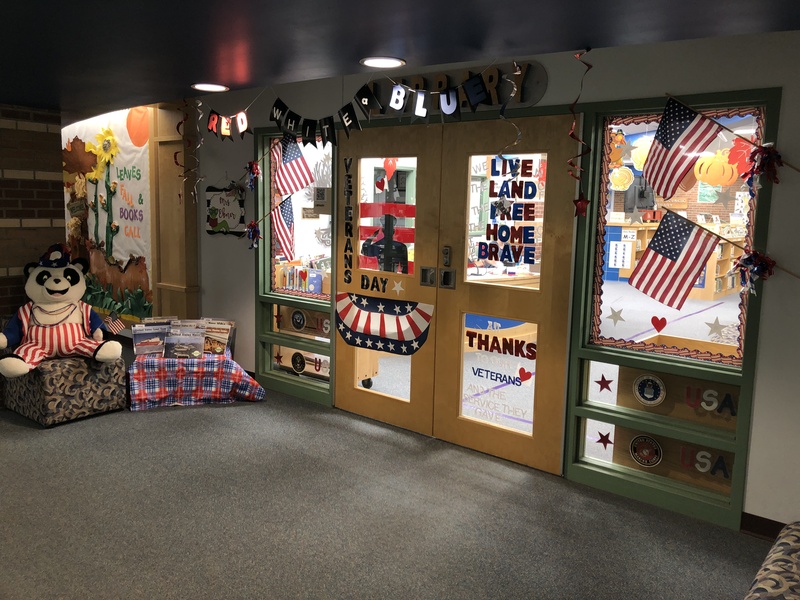 This special event was organized by Mrs. Amy Ebner, elementary librarian, with the assistance of teacher and paraprofessional volunteers. 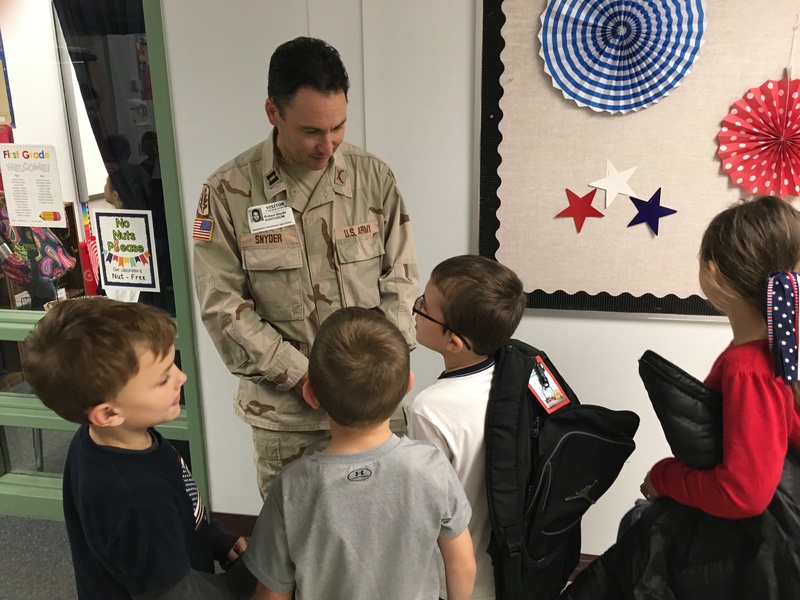 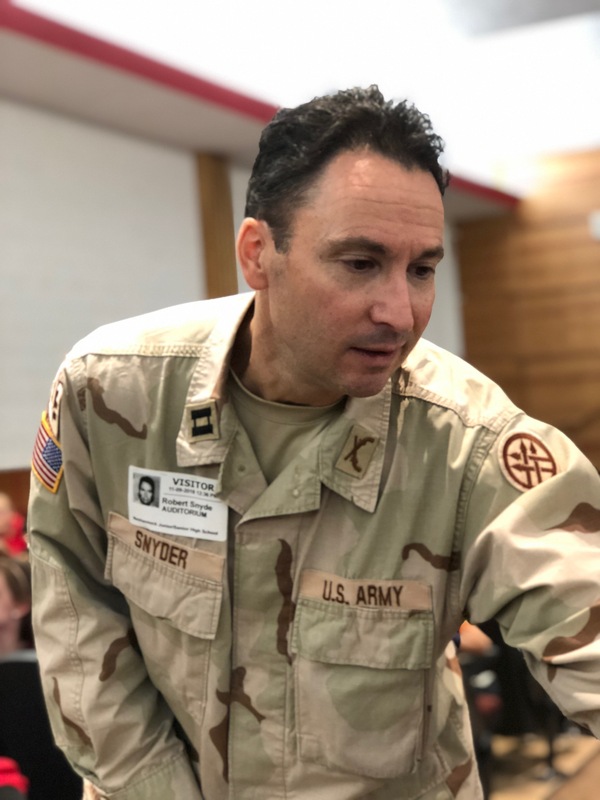 Dr. Snyder is a former elementary teacher, current teacher educator at Slippery Rock University of Pennsylvania, a 15-year Army veteran with one tour of duty in Iraq, and a recipient of the Bronze Star for his actions in Iraq. 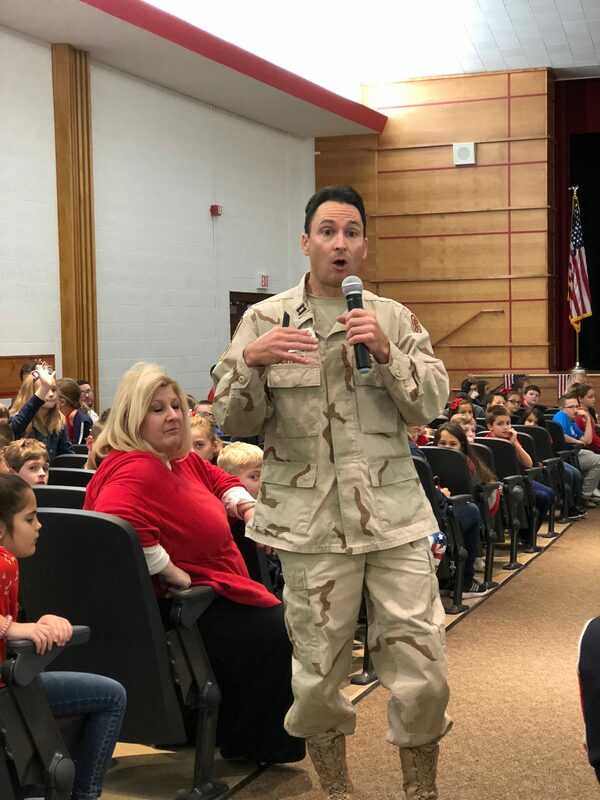 Dr. Snyder read his book, What is a Veteran, Anyway?, to the students in an incredibly unique, engaging fashion. 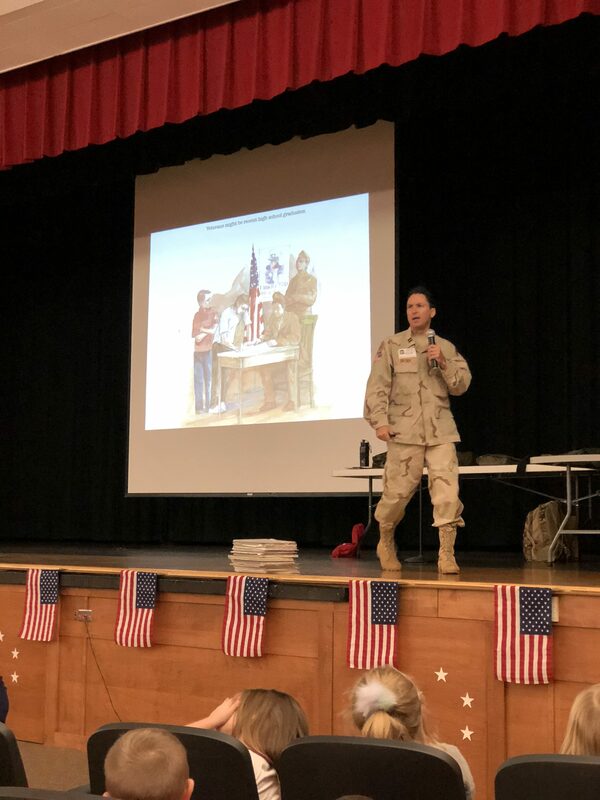 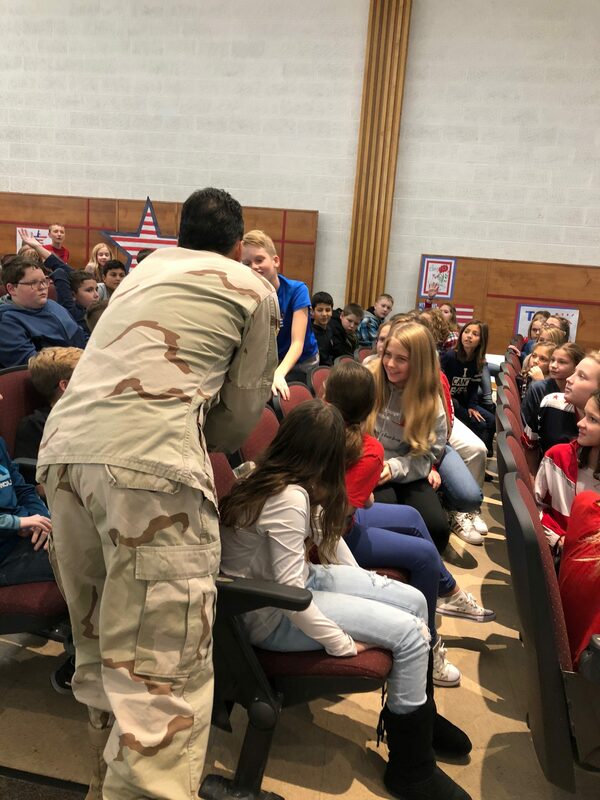 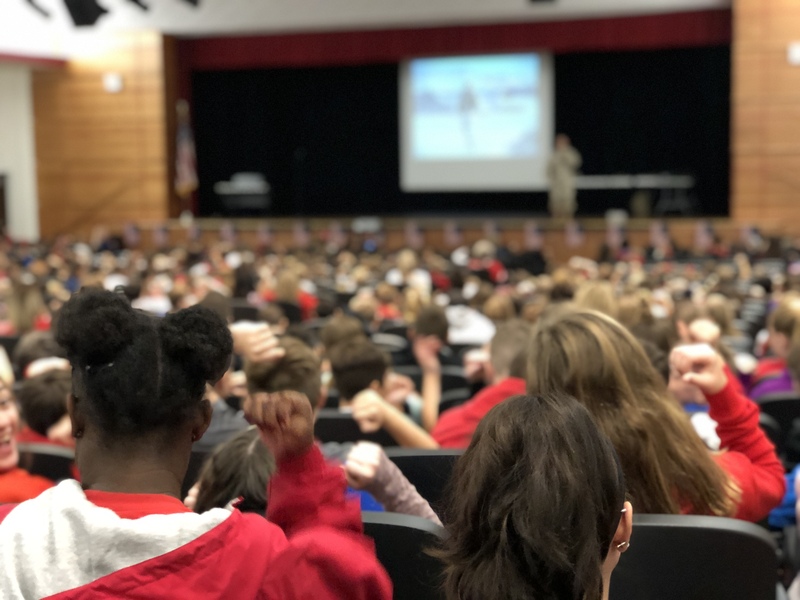 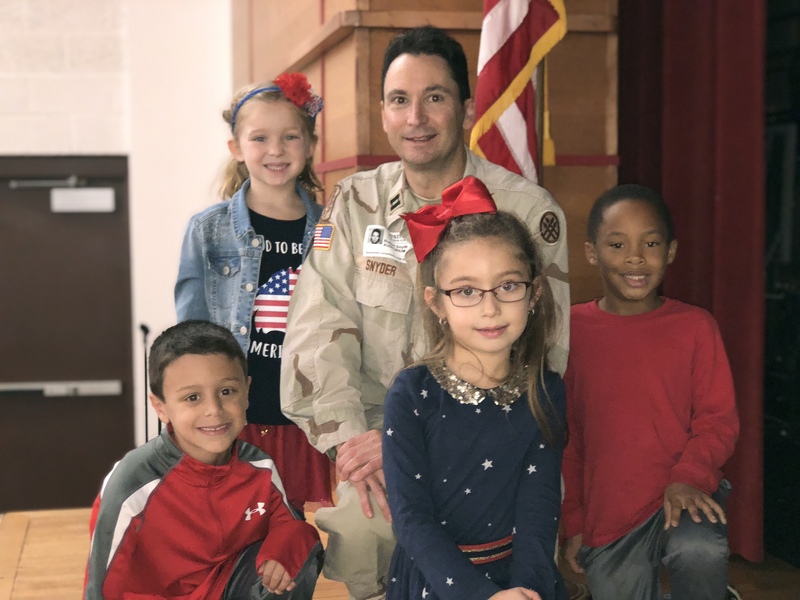 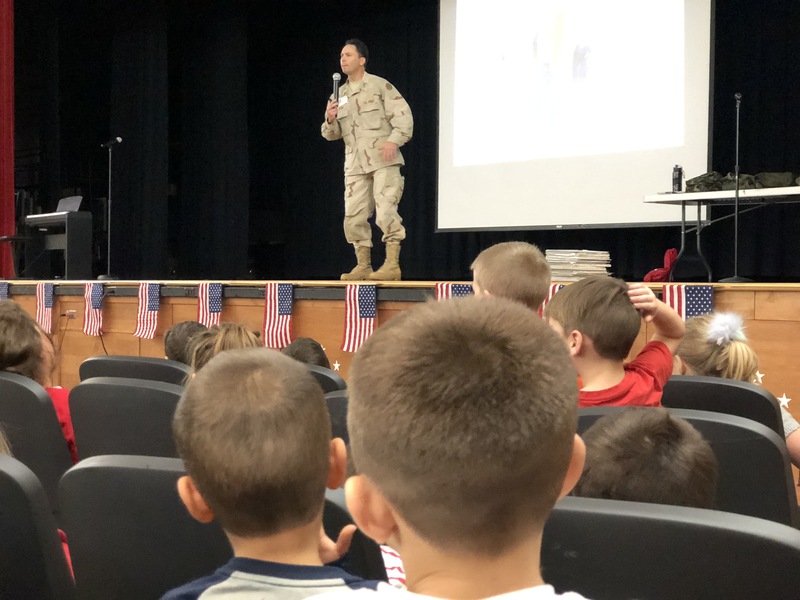 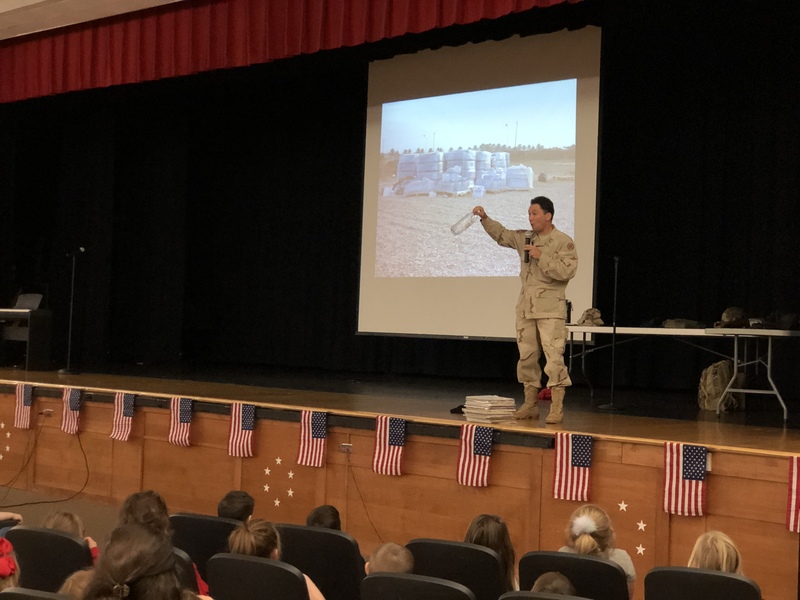 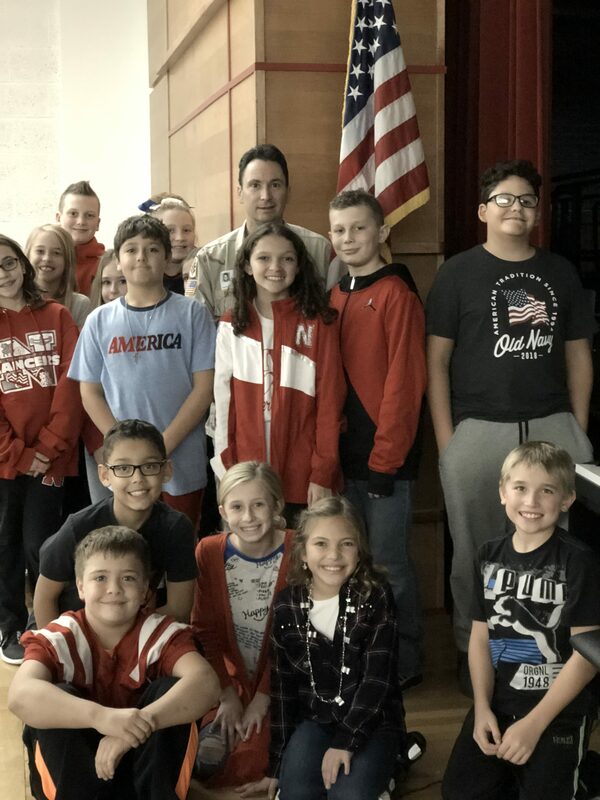 He told students stories of his experience in the Army, his time in Iraq, and gave a general overview of the various branches of the armed forces. Dr. Snyder even had a student volunteer model all of the equipment — boots, helmet, mask, bullet-proof vest, fatigues, etc. 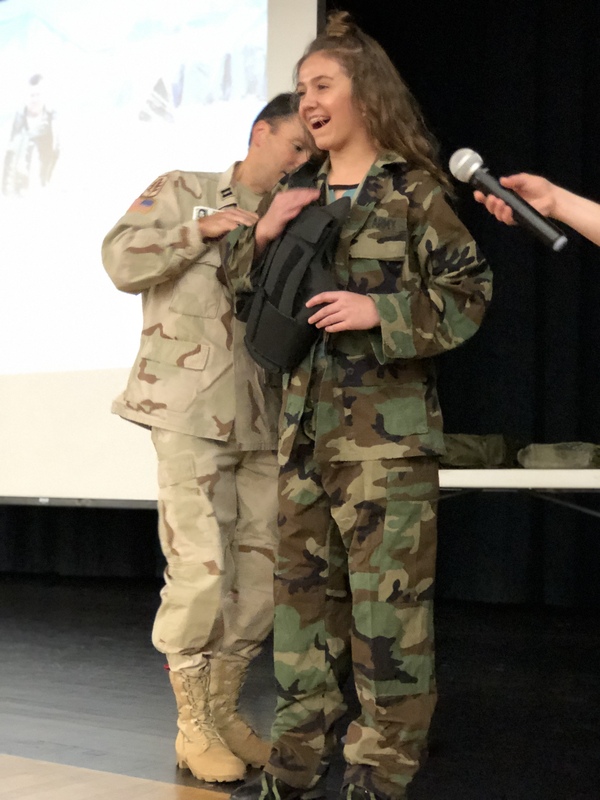 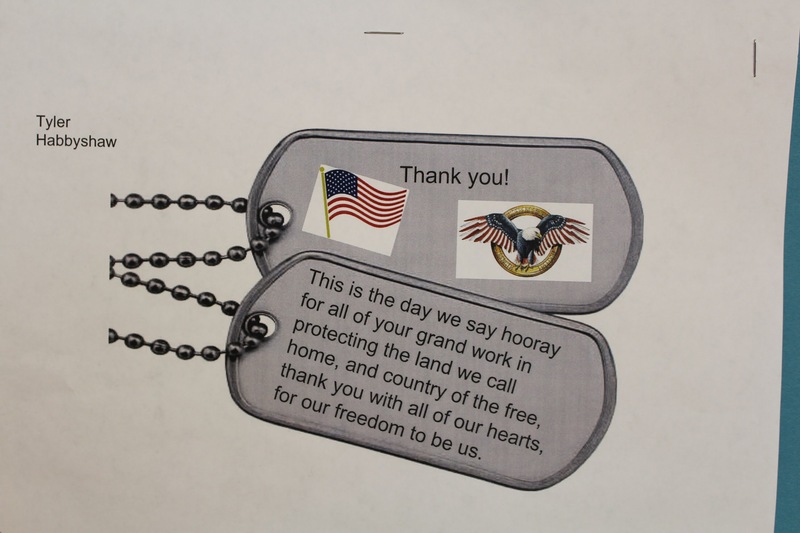 — for students to get an idea of just how many layers of heavy protective gear our military men and women must wear in order to stay safe while defending our country. 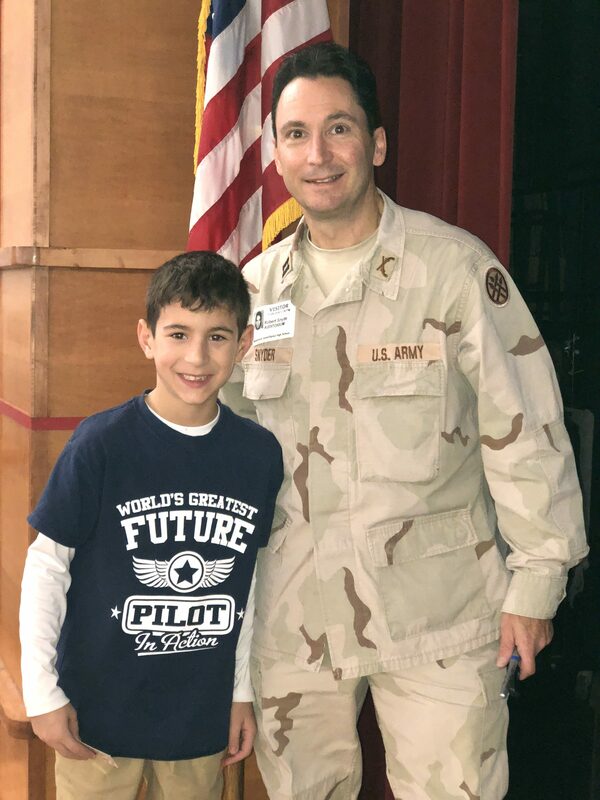 Learn more about Dr. Robert Snyder by visiting his website. 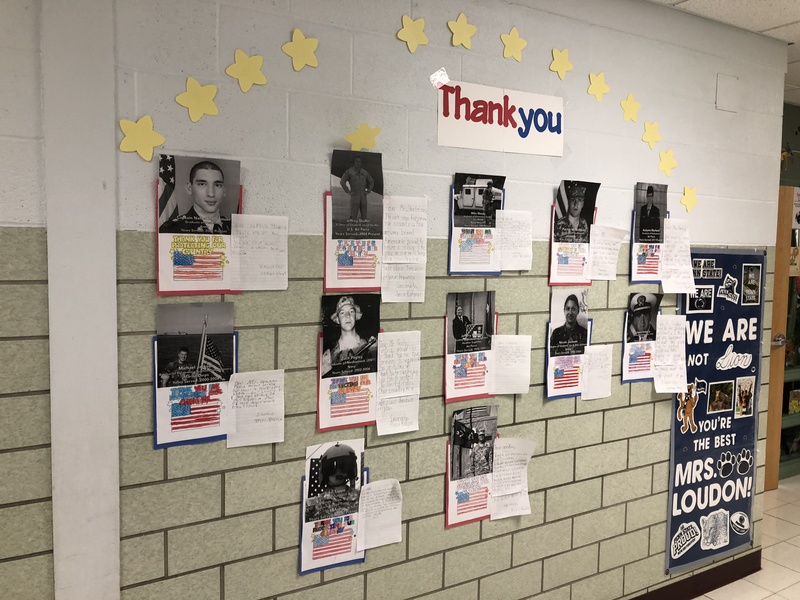 PTO created a bulletin board displaying photos of veterans related to our students.